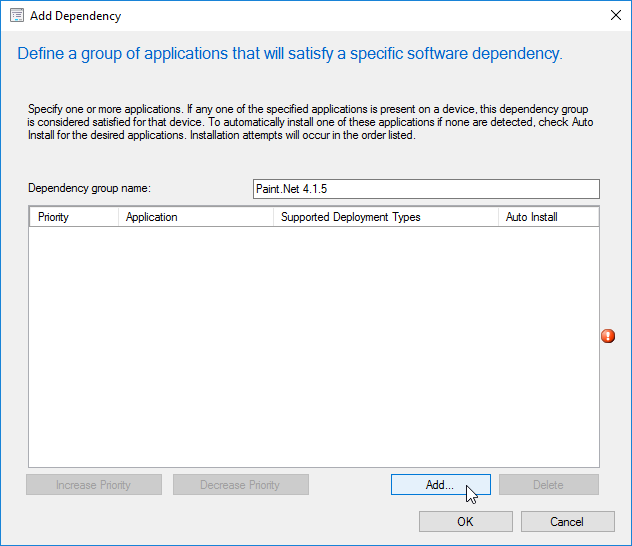 The deployment of a MSIX application may fail in case roaming user profiles are used. 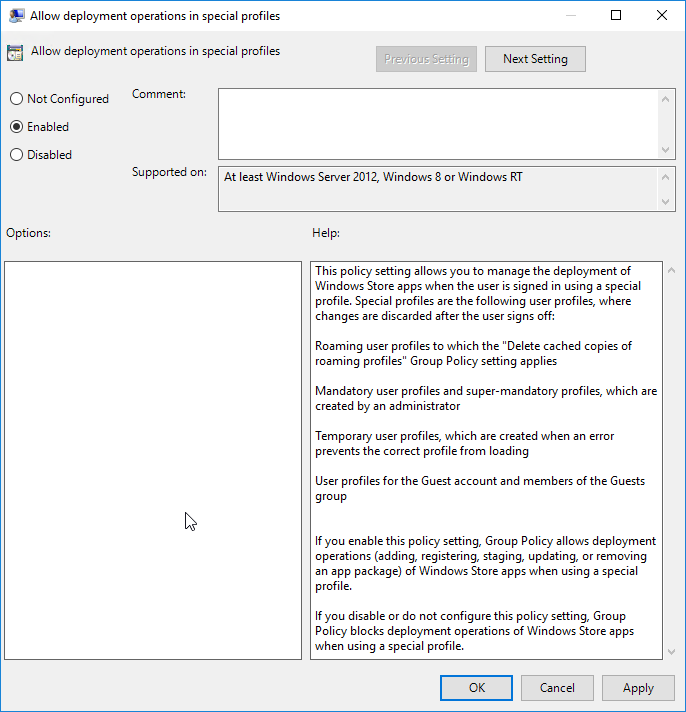 This can be solved easily with a policy adjustment. 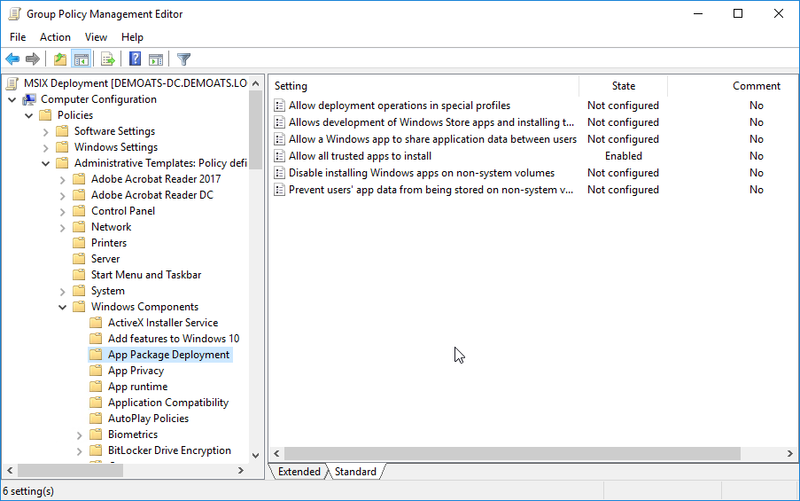 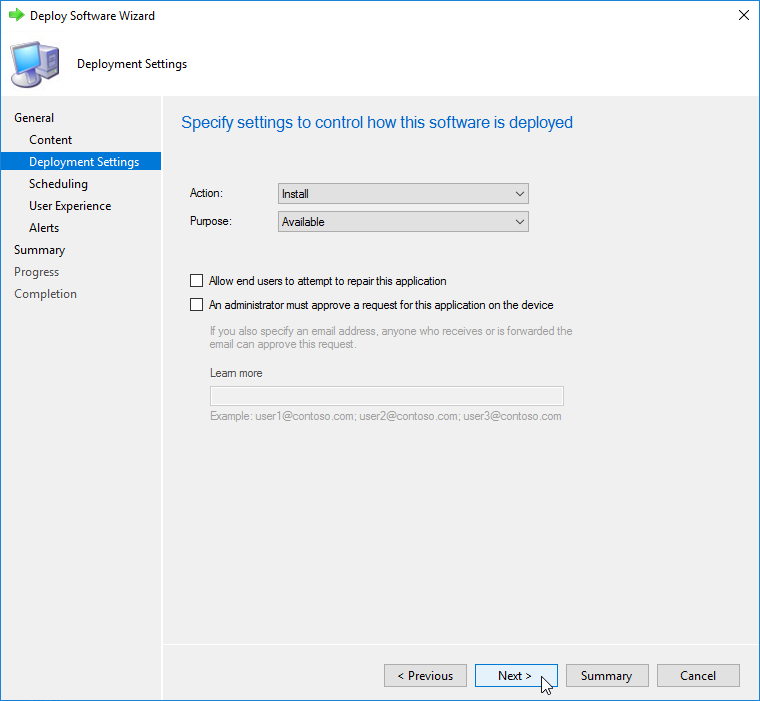 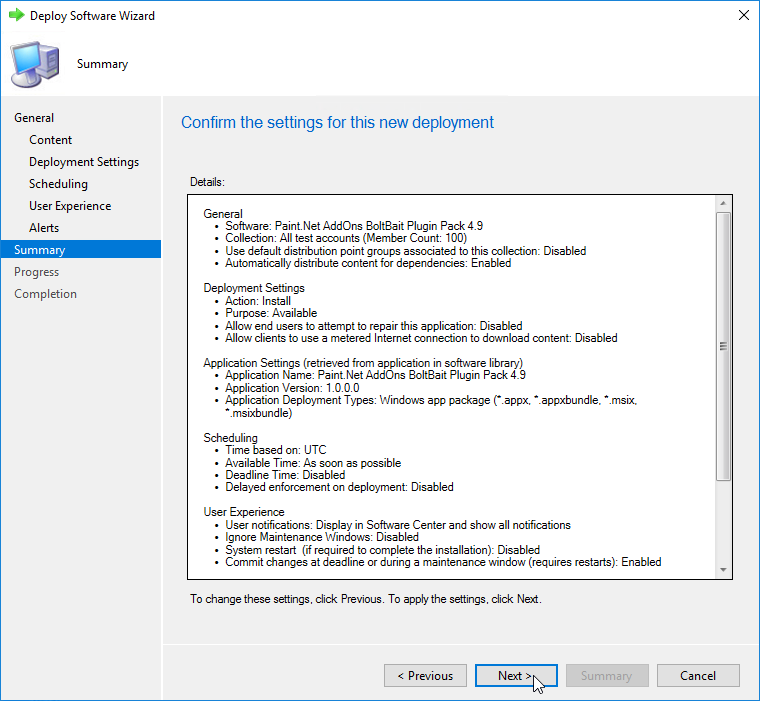 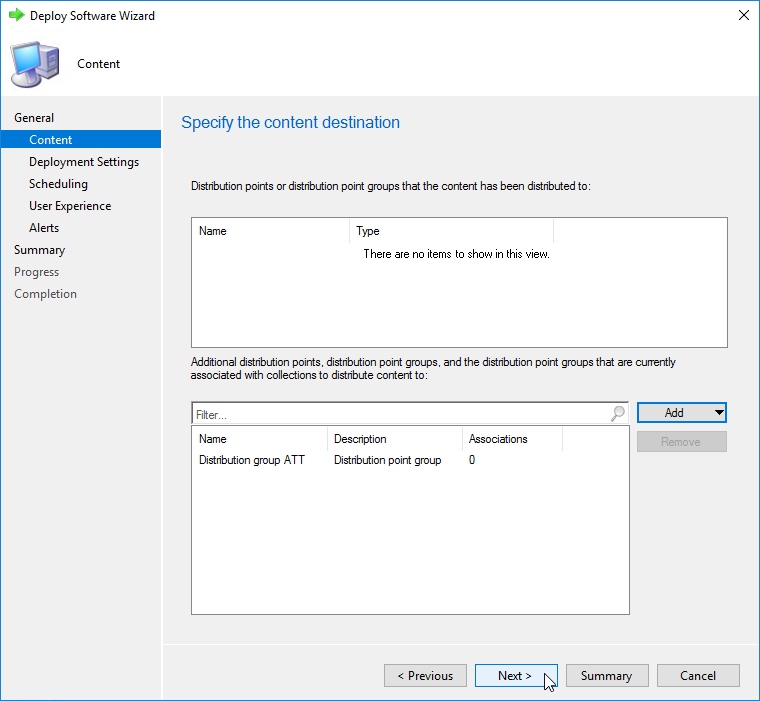 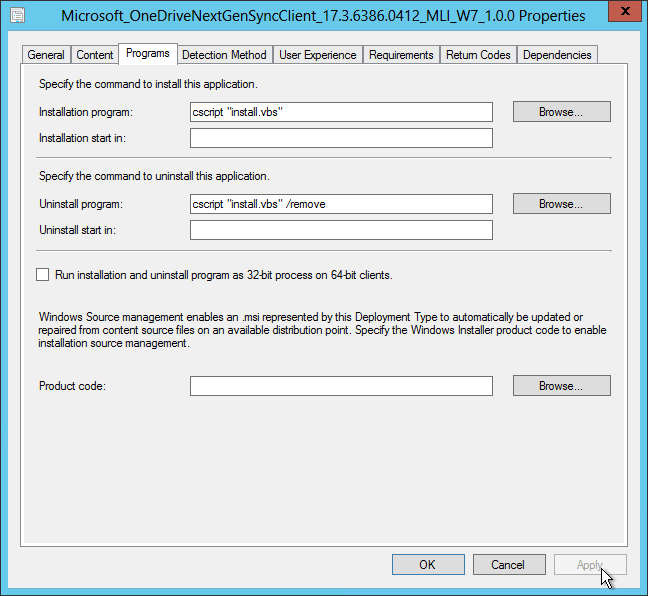 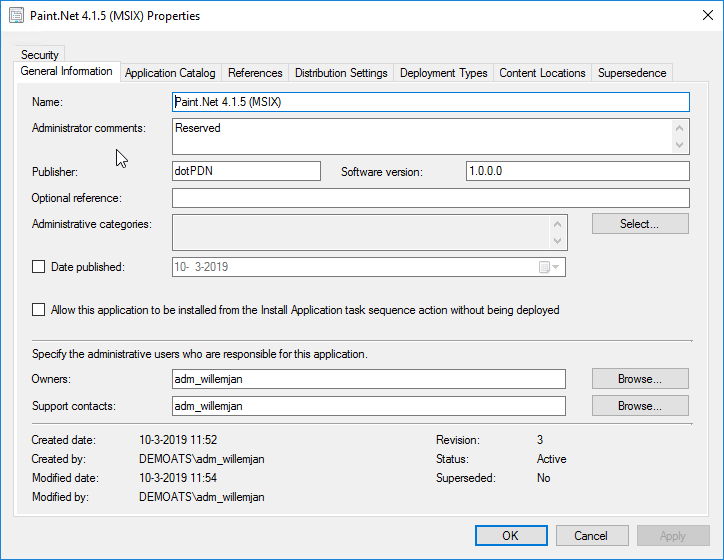 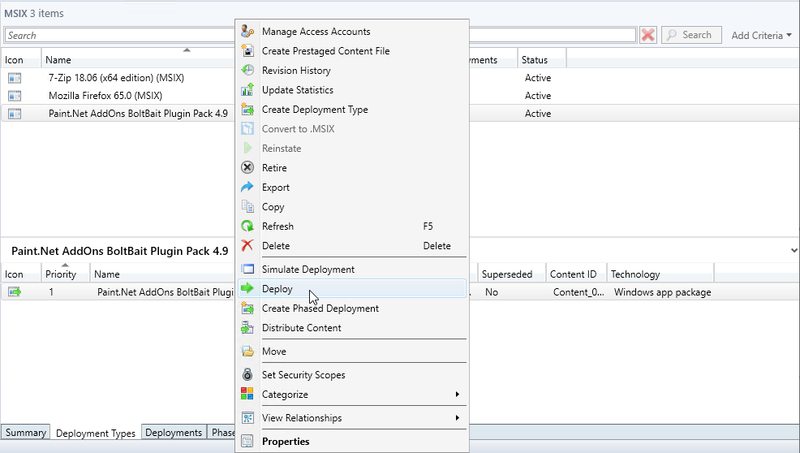 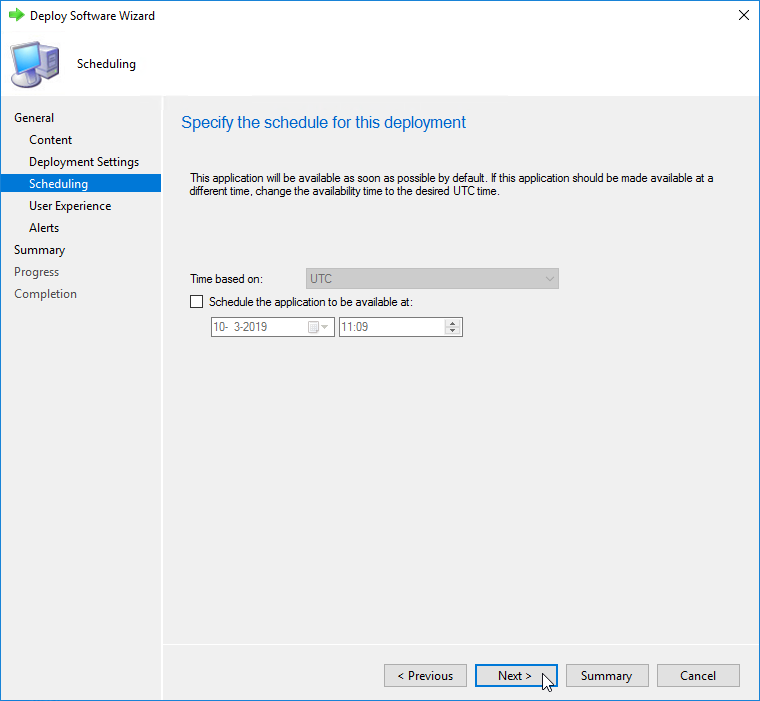 As per SCCM 2012 build 1806 it is possible to deploy MSIX packages. 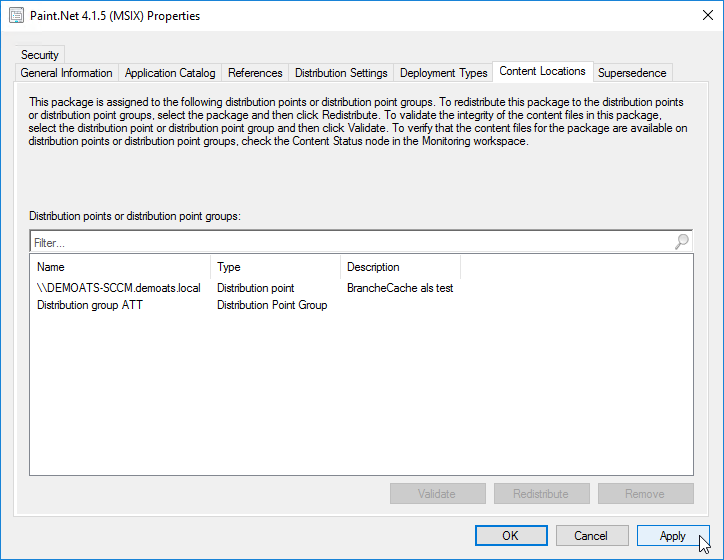 In this article, I will describe all the steps that are needed to deploy a MSIX package on a Windows 10 v1809 client. 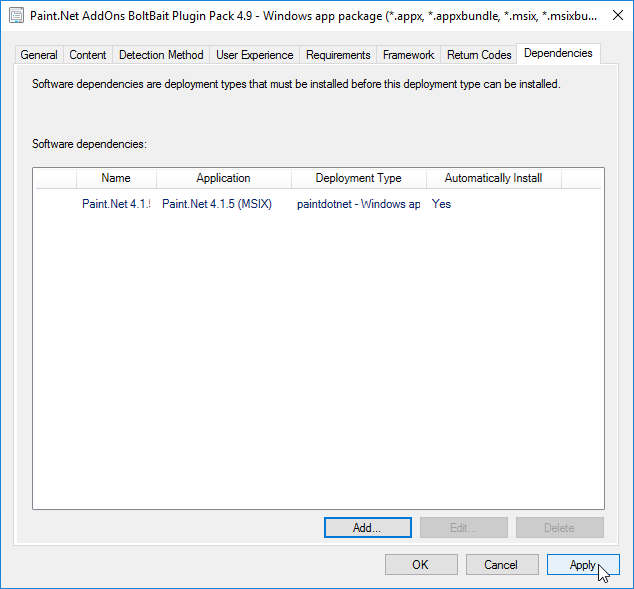 In the article Package and install a MSIX package Paint.Net 4.1.5 was packaged as a MSIX package. 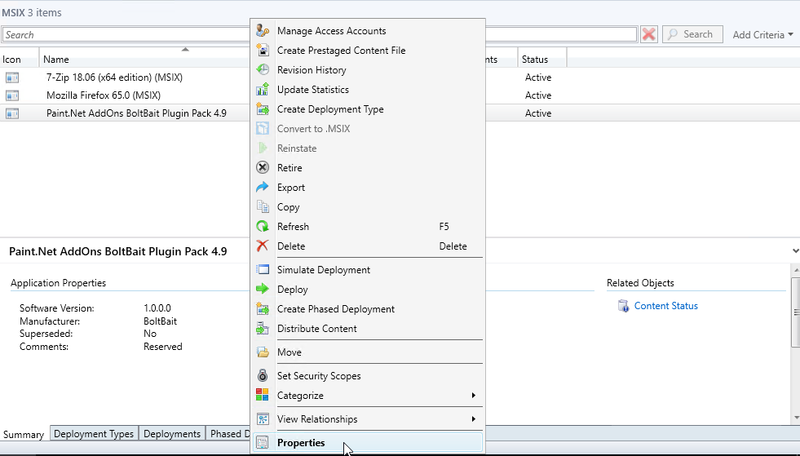 In Create a MSIX modification package a modification package was created to add some addins. 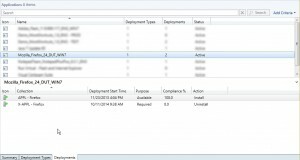 In this article both applications will be used. 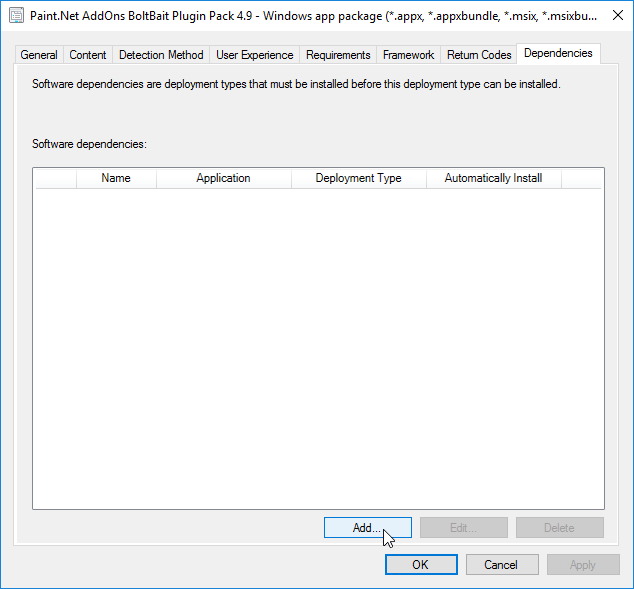 Before the Paint.Net Addin package can be deployed, it is mandatory to have the dependency application deployed first. 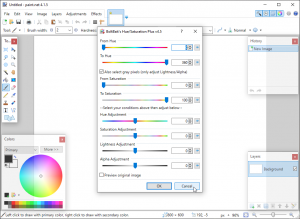 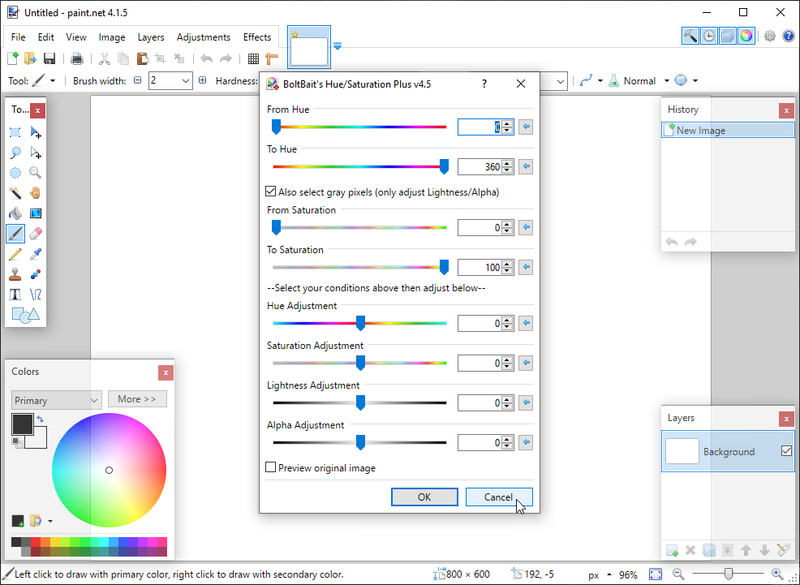 PaintNet has been distributed to all the distribution points as it is a dependency application (SCCM wise). 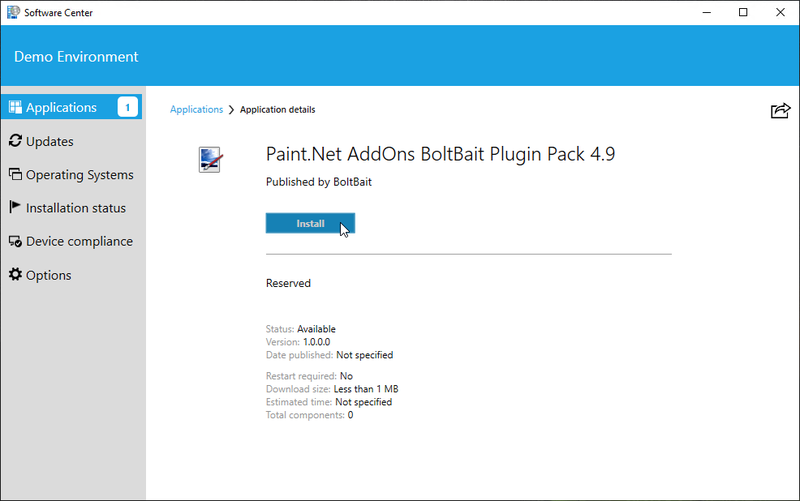 Paint.Net has been distributed to all distribution points. 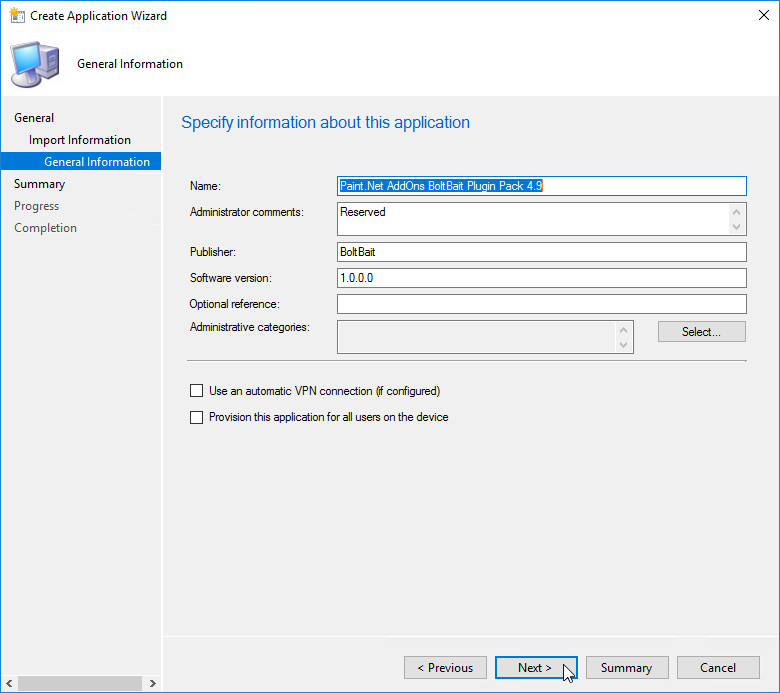 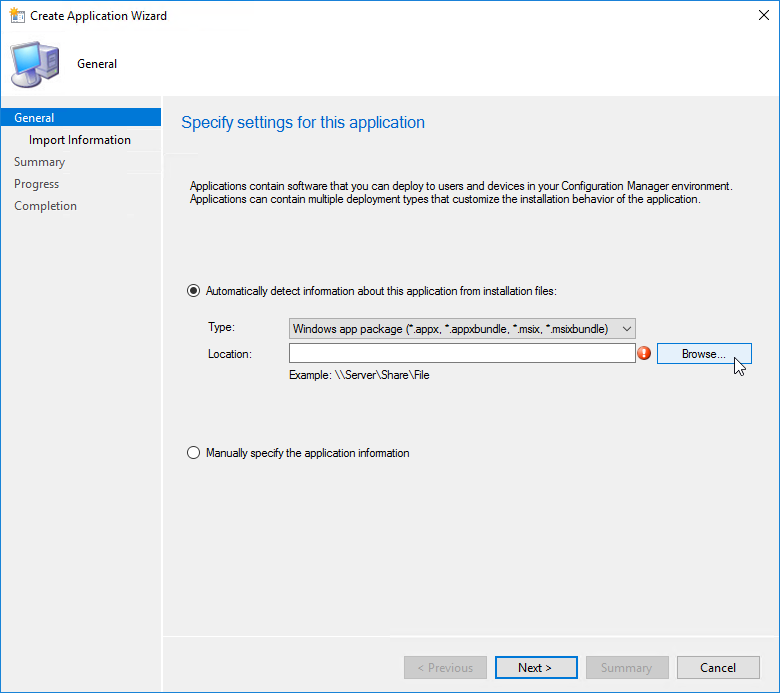 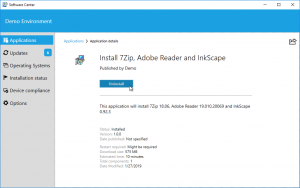 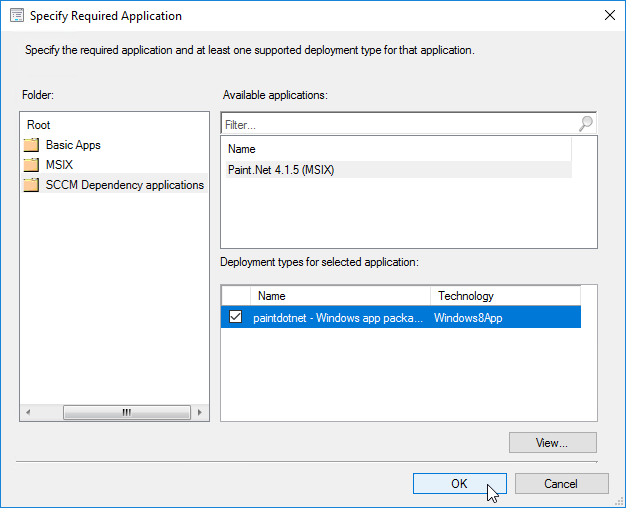 Create a new application in SCCM. 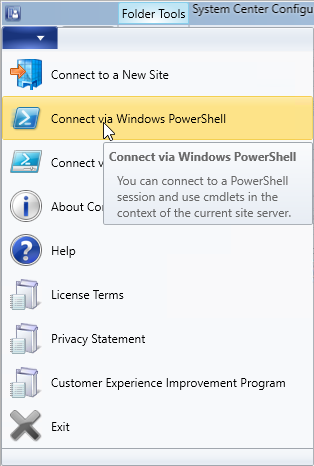 Click [Browse] to select the msix file. 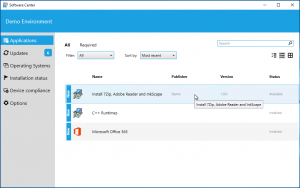 Browse to the msix plugin file. 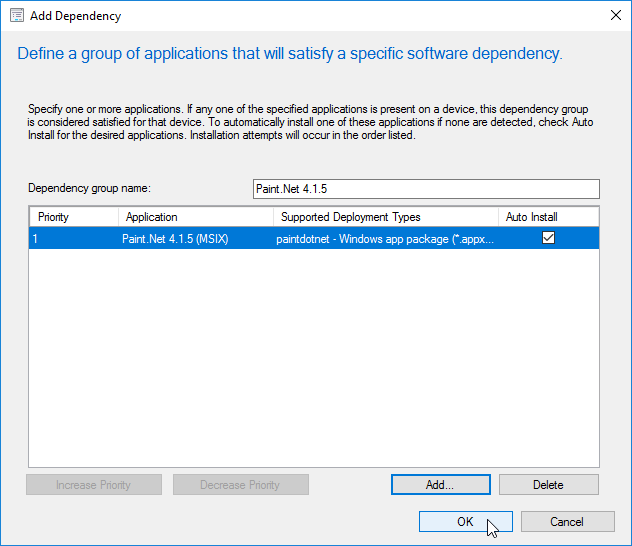 Go to the properties of the deployment type. 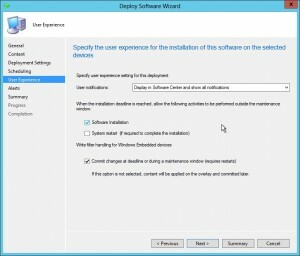 Changing the icon that shows up in Software Center. 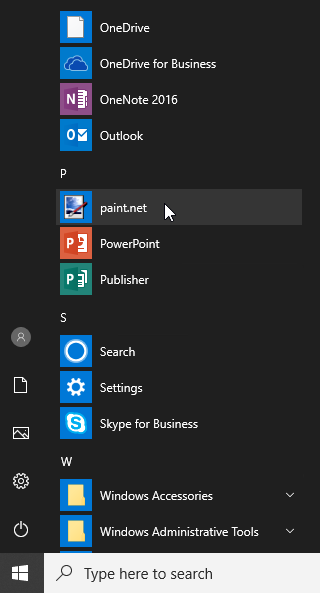 Find the correct icon to show in Software Center. 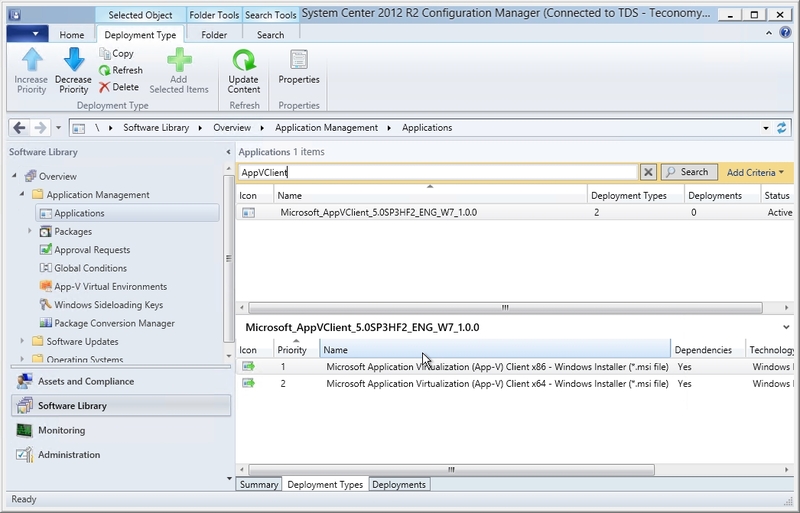 Find the application in Software Center. 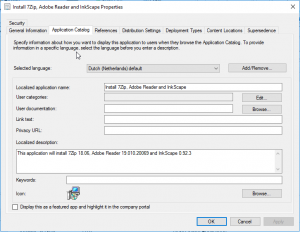 Double click on the application. 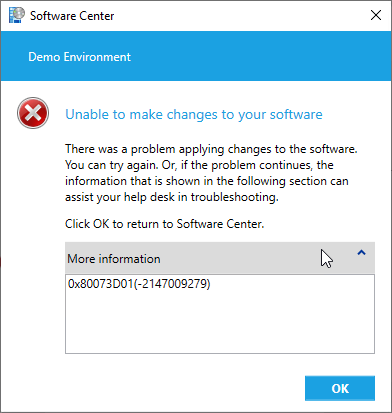 Close software center after a successful installation. 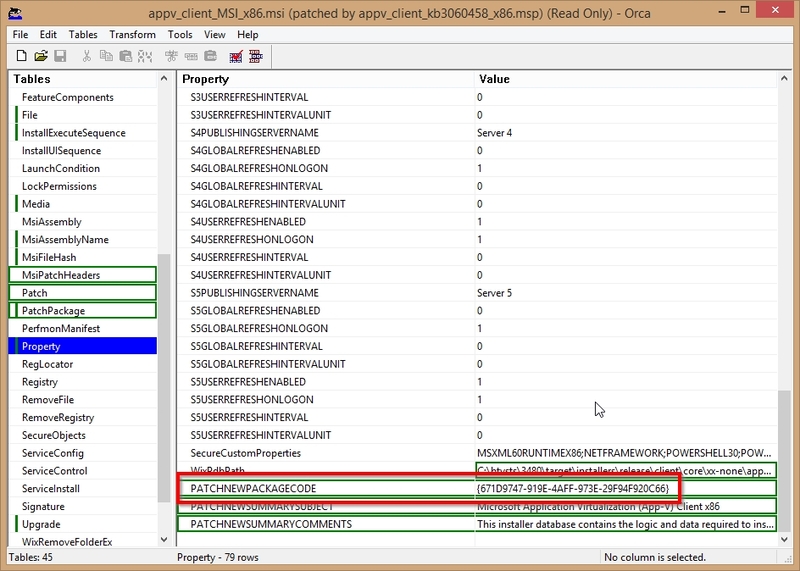 And the addins are used. 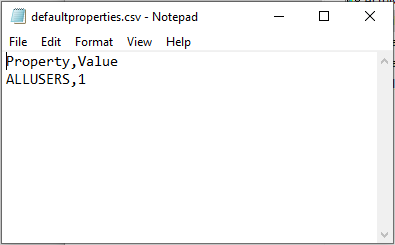 - .csv     -> will be applied only to the given MSI or MSI / MST combination. 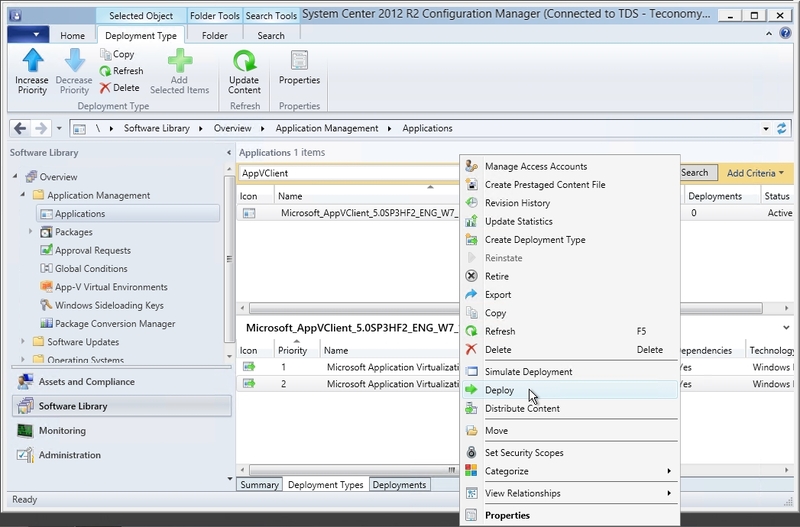 You might have had this earlier: editing an application in SCCM 2012, the SCCM console crashes. 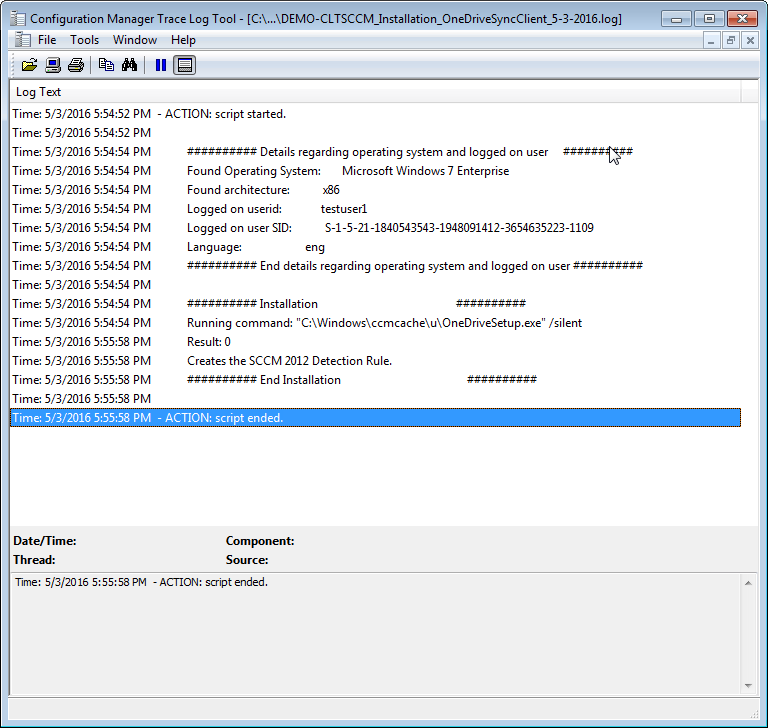 And when you want to continue, you get the error: The following objects are not available and will not be edited. 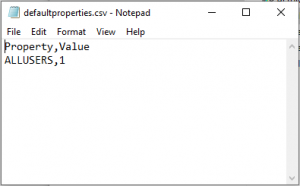 In this article, I will describe 2 solutions. 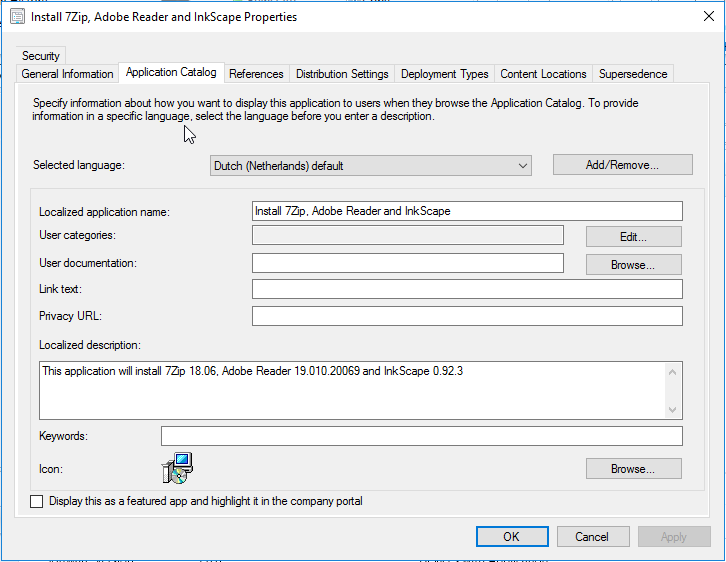 There is no feedback, but you can edit the application again. 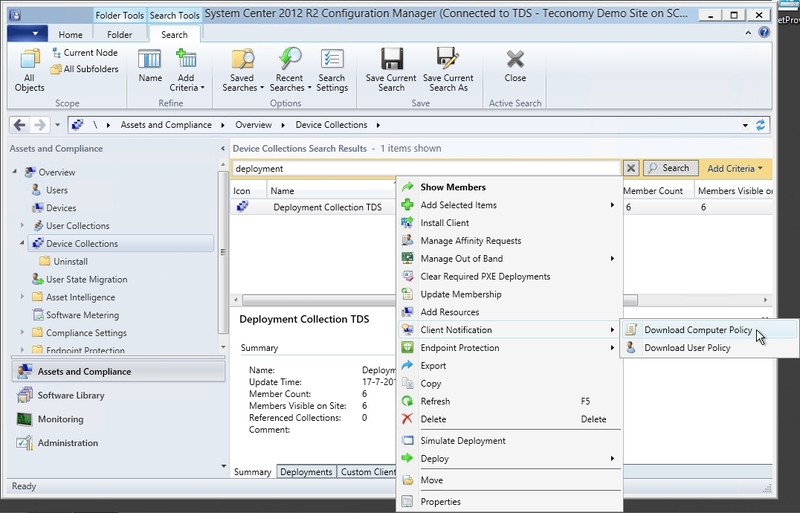 An alternative way is via SQL Server Management Studio. 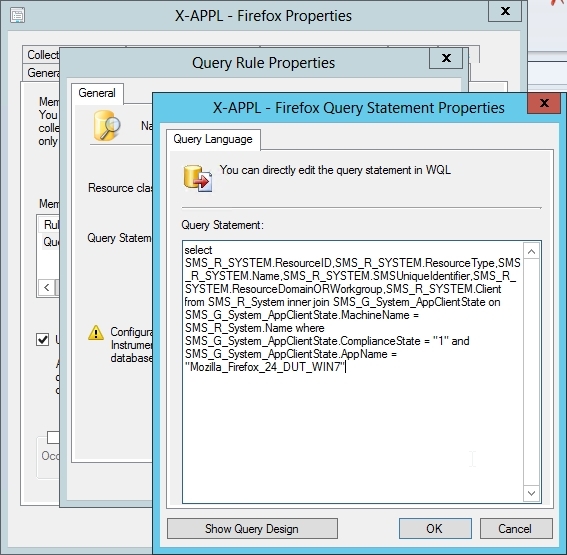 Create a new query. 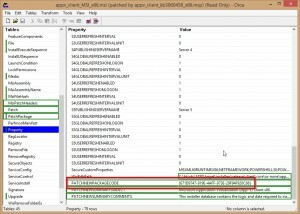 And connect to the correct database. 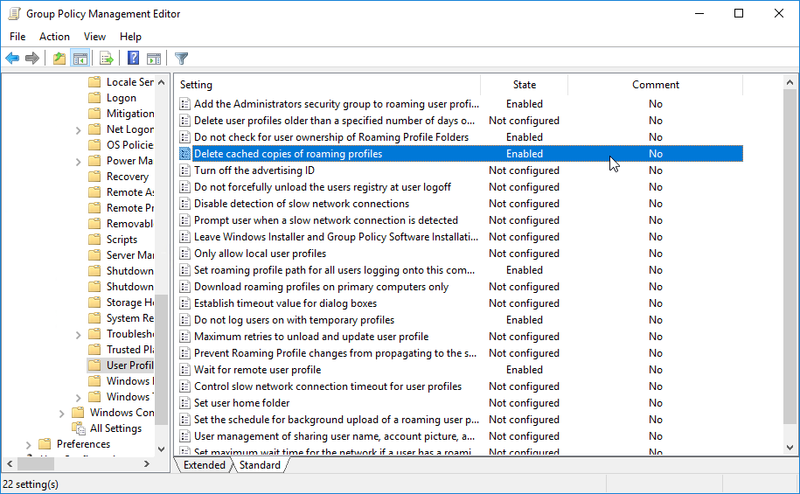 There might be multiple lines, as multiple users may have various applications locked. 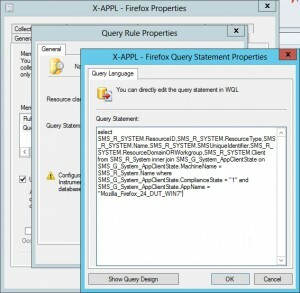 Find the correct one. 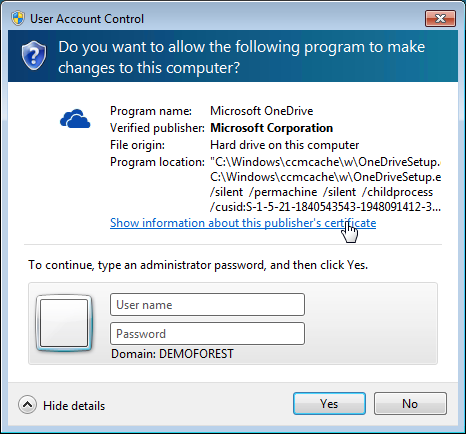 Copy the LockstateID. 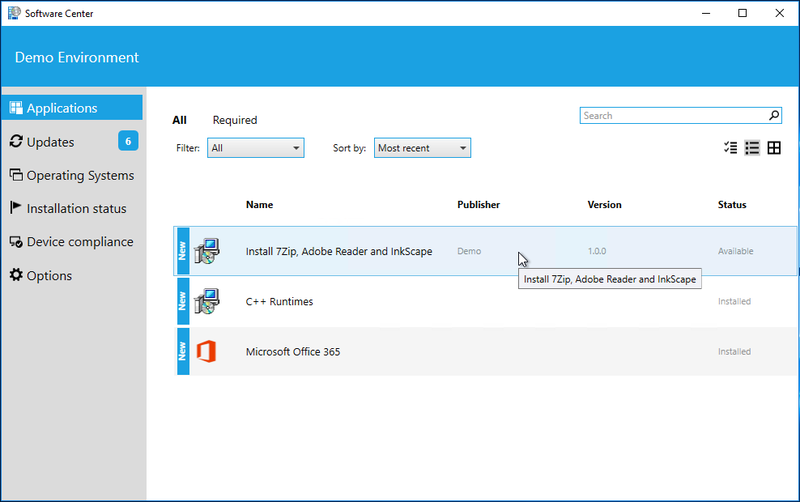 And you can edit your application again. 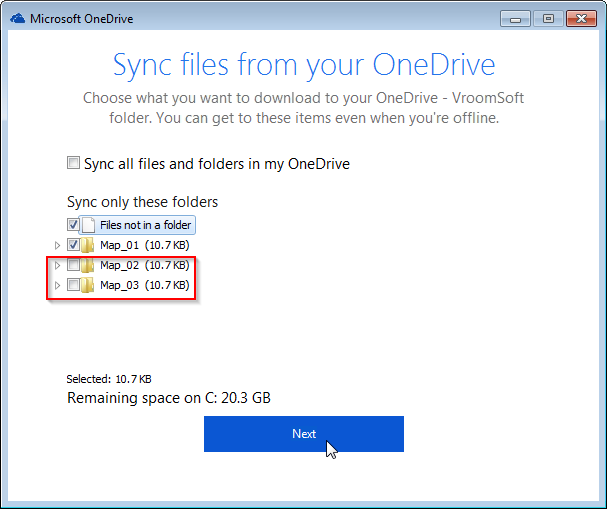 Unable to sync files with OneDrive for Business. 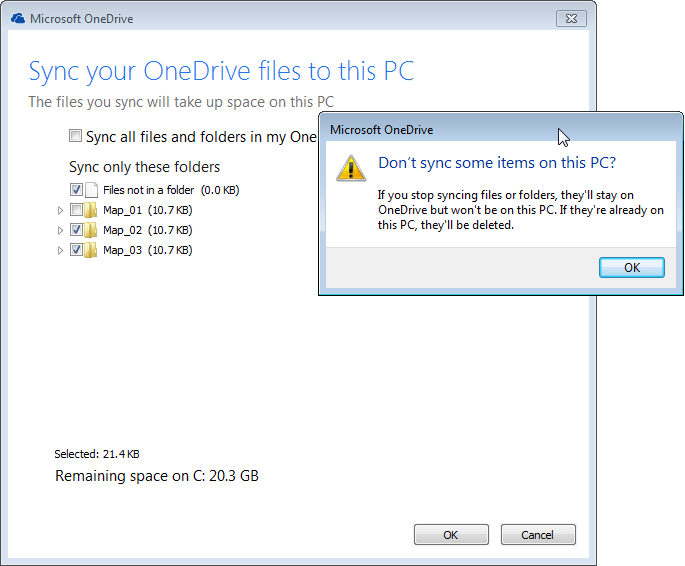 This can be solved by installing the new OneDrive Next Gen Sync Client. 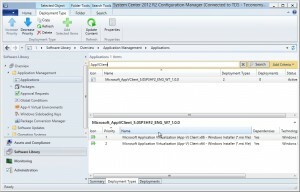 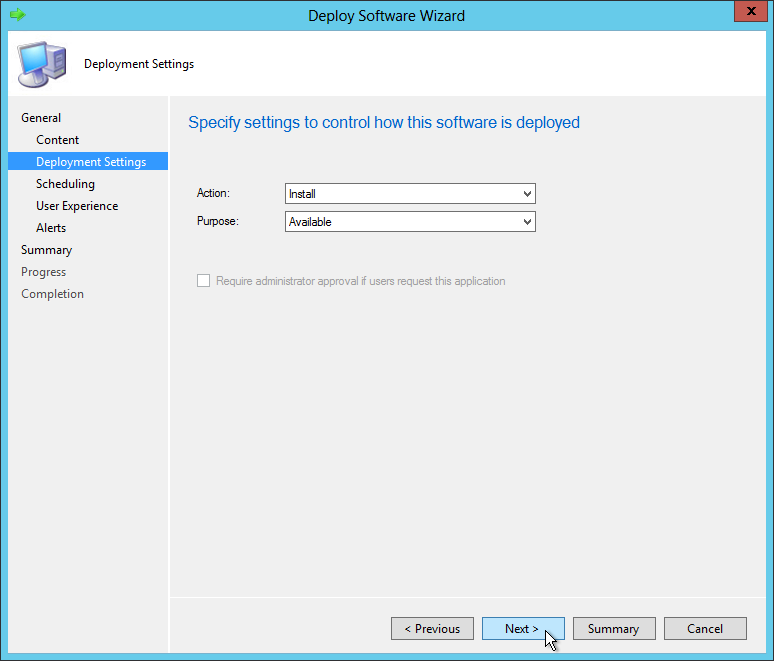 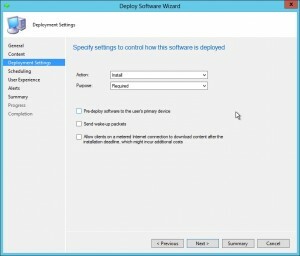 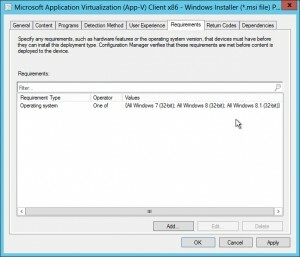 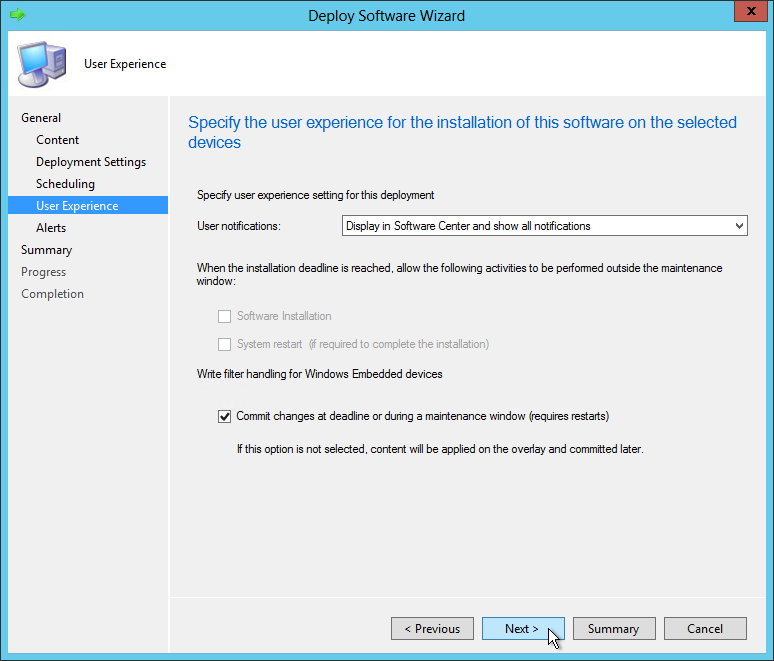 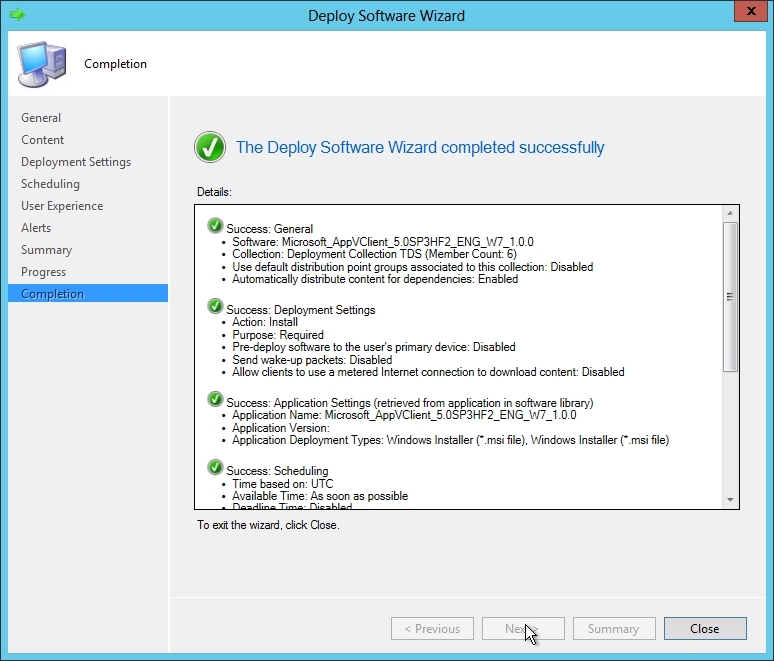 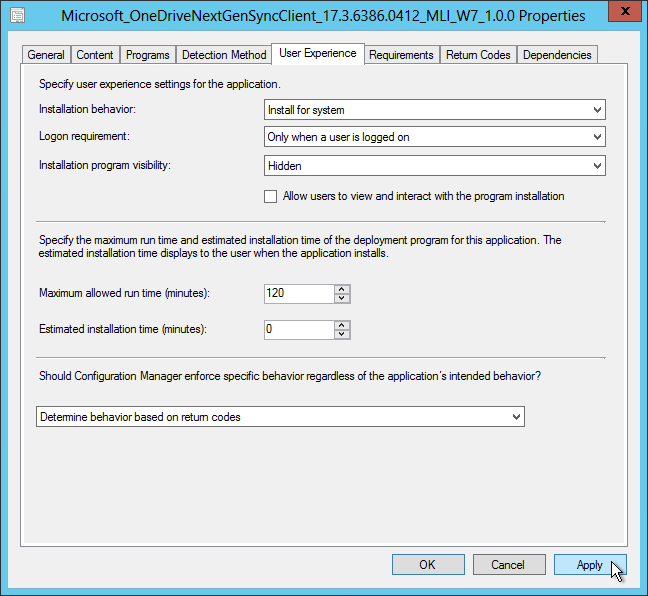 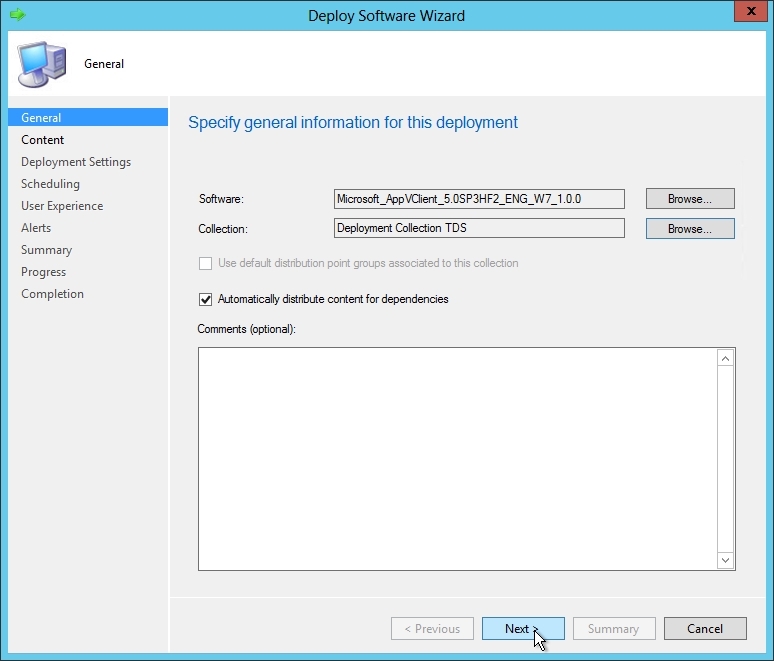 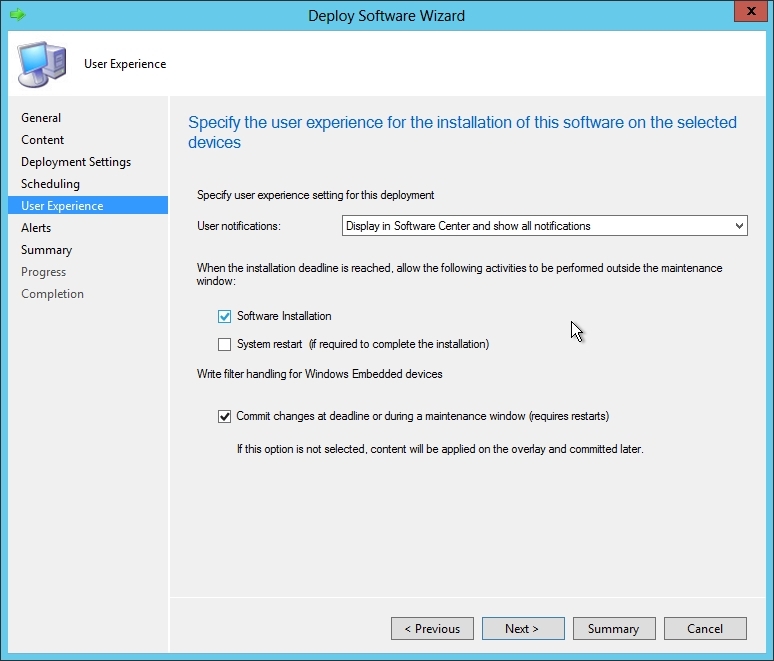 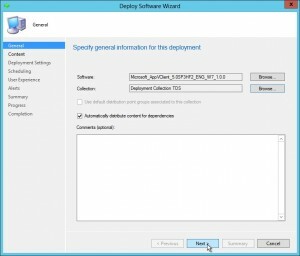 In this article I will describe how this application can be installed via SCCM 2012. 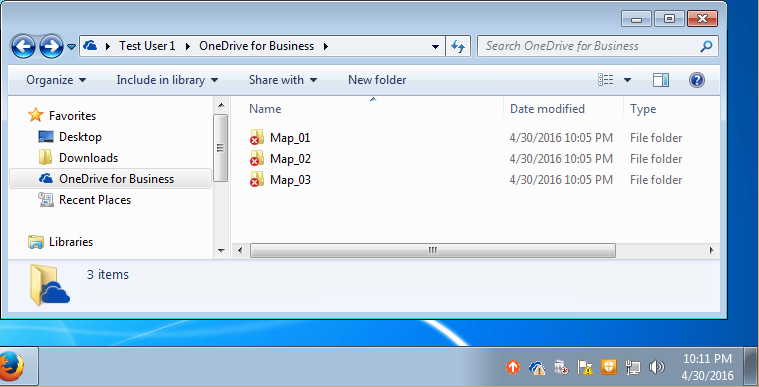 Please be informed that you still need the OneDrive for Business client to synchronize with Sharepoint lists. 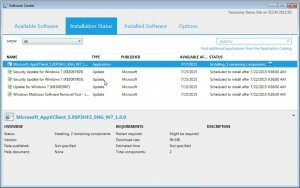 Failure as admin rights are needed to install. As you can see, there are ‘hidden’ admin rights needed. Created a vscript that installs the application and sets a detection rule after a successful installation. 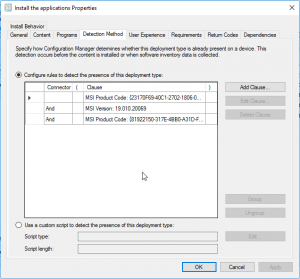 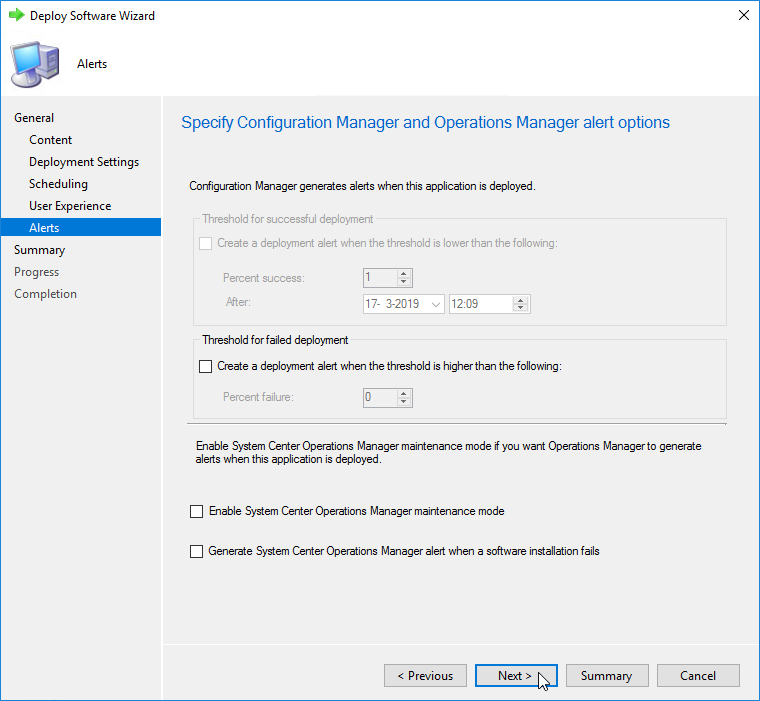 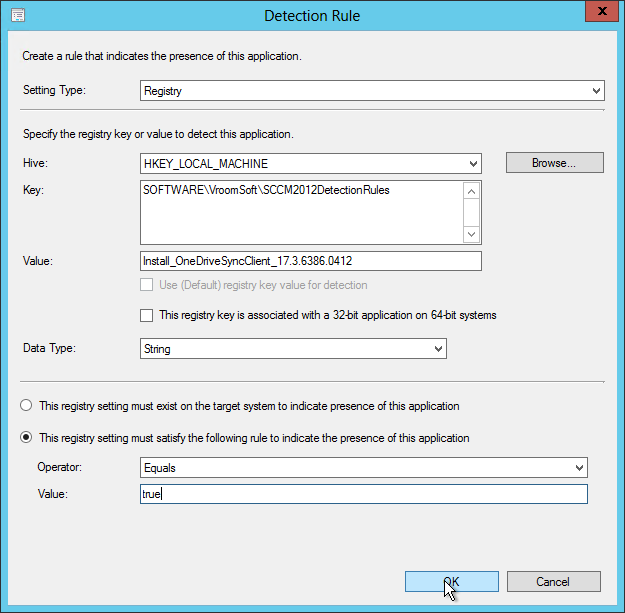 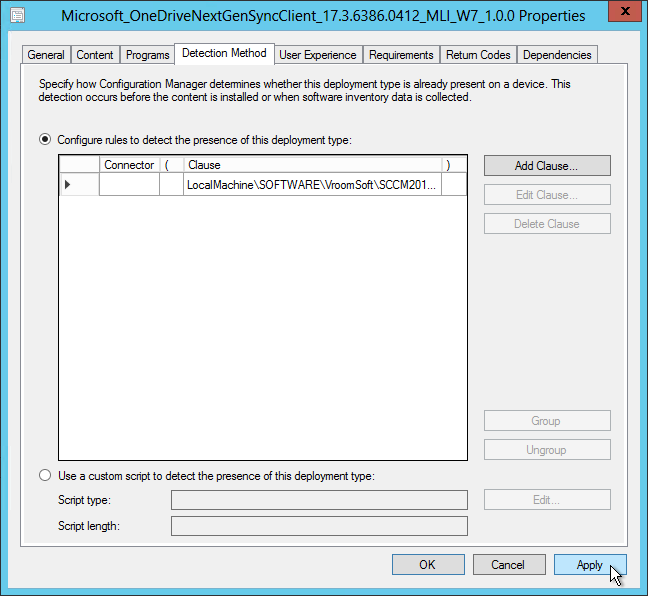 The detection rule can be used in SCCM 2012 to detect a successful installation. 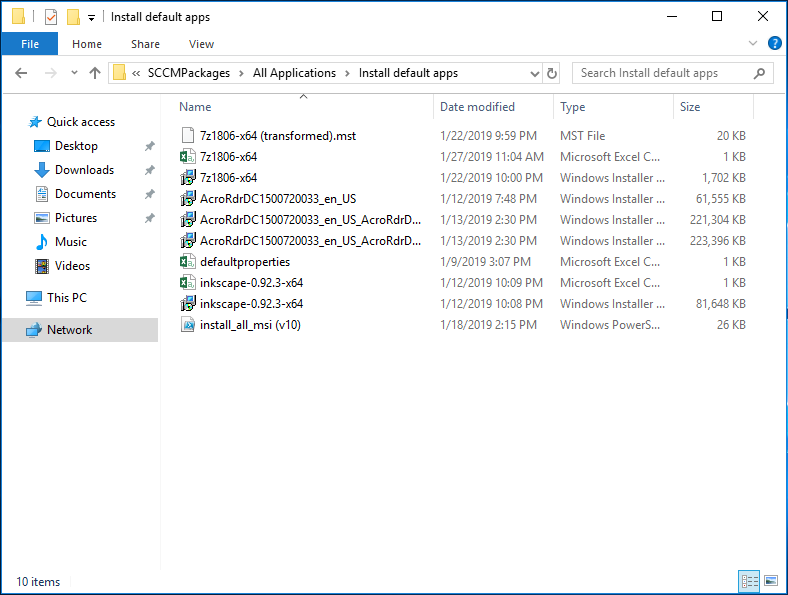 Dim strOutputFile                     : strOutputFile                     = strLogLocation & "\" & strcomputerName & "_Installation_OneDriveSyncClient_" & Replace(FormatDateTime(Now(), 2),"/","-") & ".log"
Dim strArchitecture                   : strArchitecture                   = "x86"
Dim strCommonPrograms                 : strCommonPrograms                 = ""
Dim strFileToDelete                   : strFileToDelete                   = ""
Dim strDotNetInstallPath              : strDotNetInstallPath              = ""
' Close applications that might screw up the installation.
' 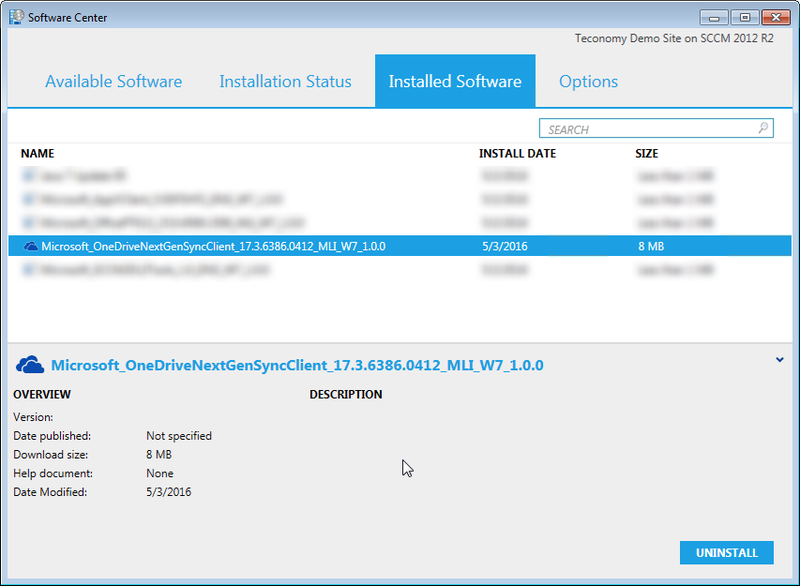 Uninstall other Samsung Kies installations.
' 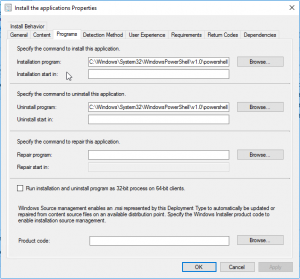 if the command line option '/uninstall' is given, then only a uninstall and quit. 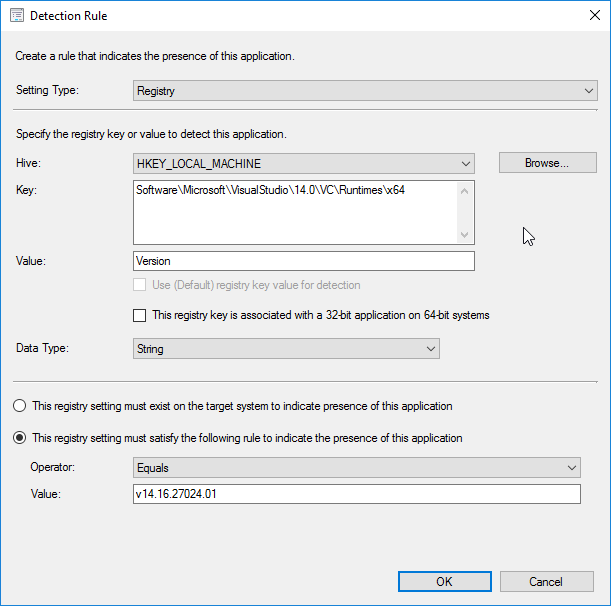 strCommand = strCommand & " /silent"
if strValue = "nb" then strLanguage = "nor"
' Creates the SCCM 2012 Detection Rule to detect a successfull installation.
' 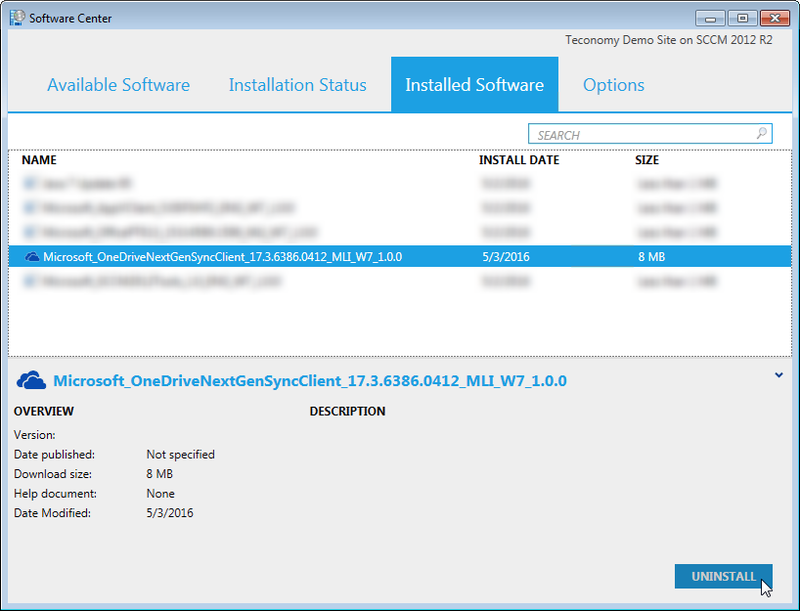 Removes OneDrive Next Gen Sync Client. 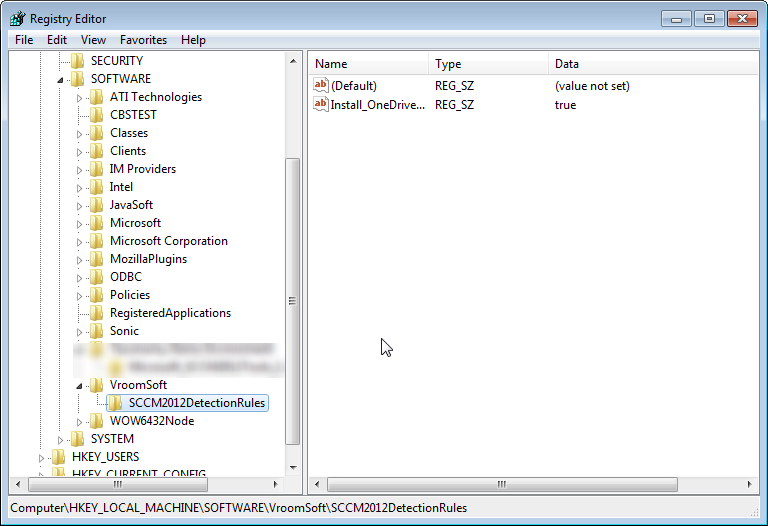 strCommand = strCommand & " /uninstall"
Detection rule set in the vbscript. You can find the new application under installed applications. 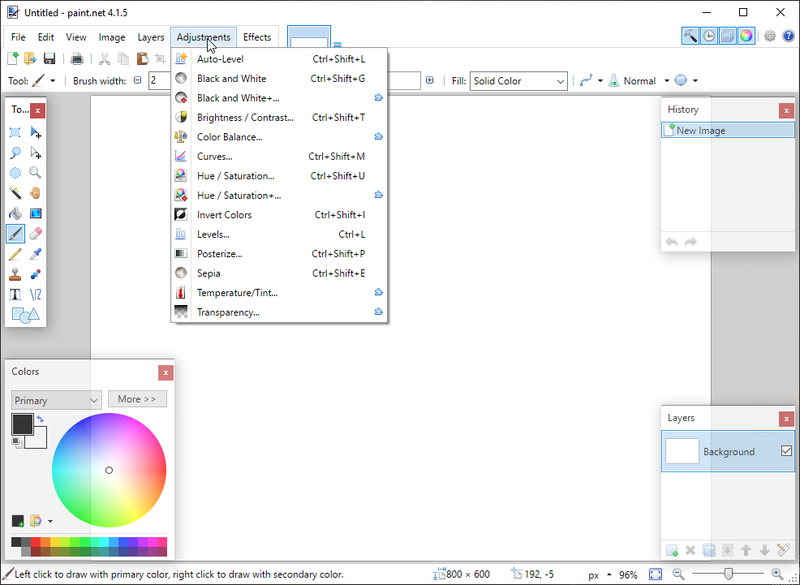 You can select the folders you want so synchronize. 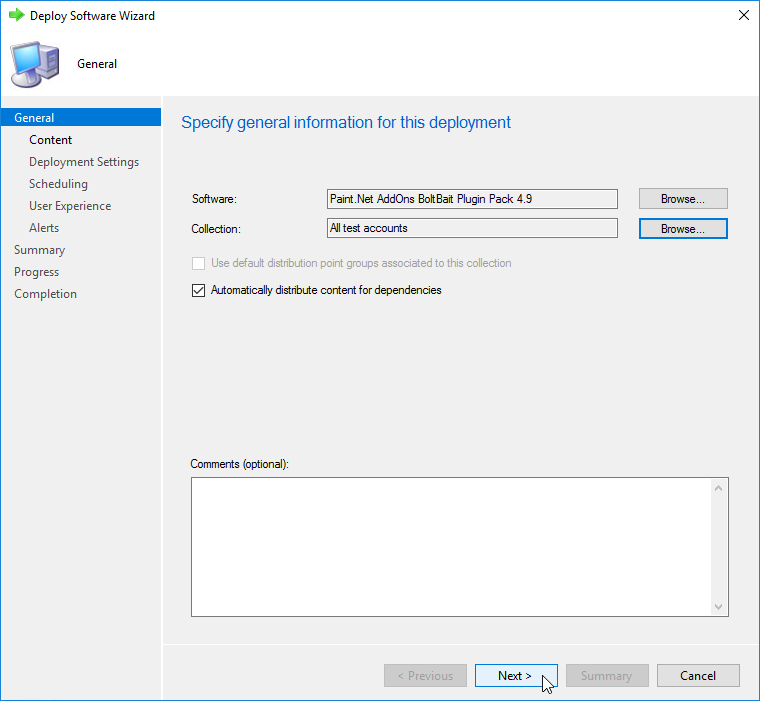 Unselect the folders you do not want to synchronize. 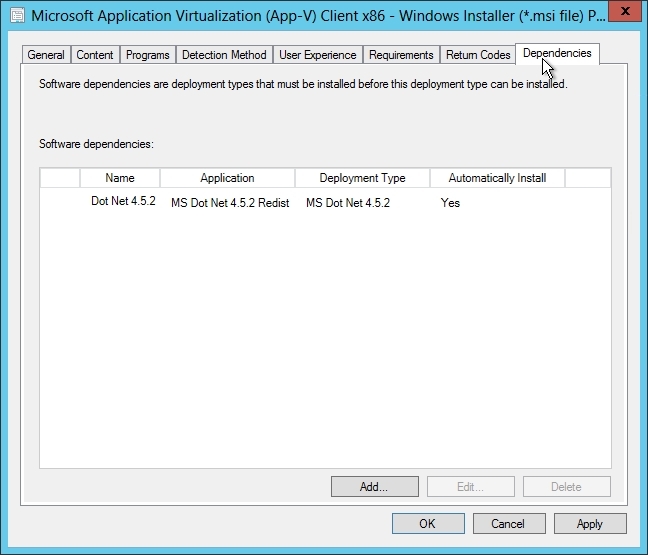 If you want to deploy AppV 5.0 packages, a client is needed. 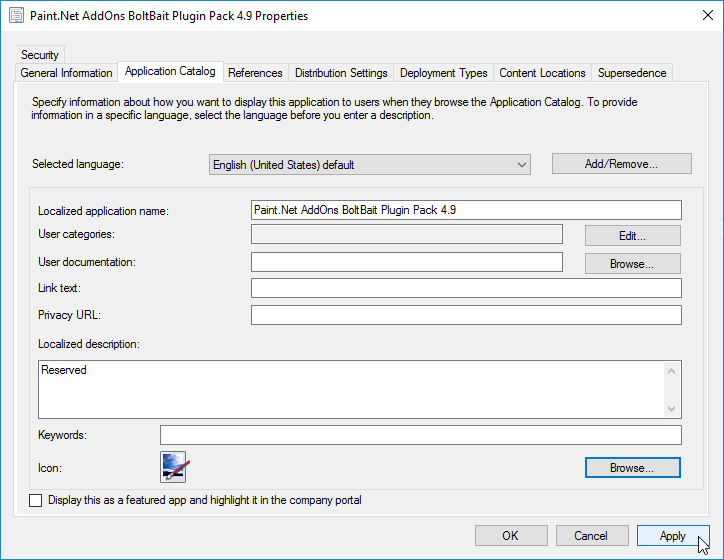 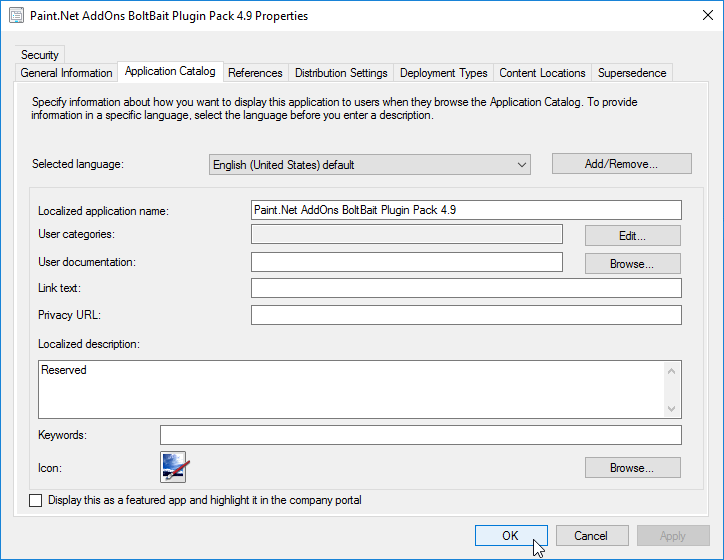 In this article I will describe all the steps that are needed to install the latest AppV 5.0 client. When writing this article it is AppV 5.0 SP3 with hotfix 2. This version is not available as a ‘complete’ version. First you will have to install AppV 5.0 SP3 client, followed by the hotfix. 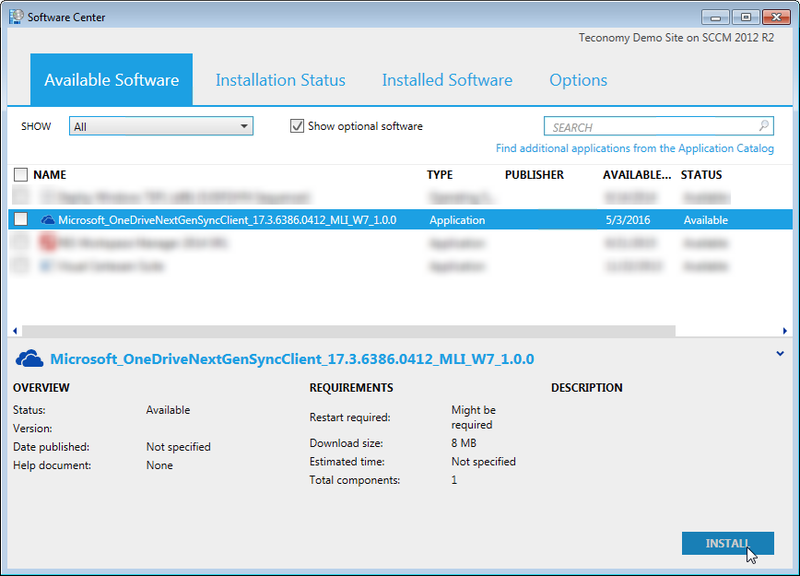 Fortunately you can ‘merge’ this 2 versions in one installer. 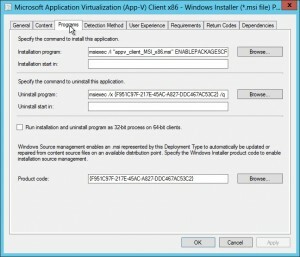 If you extract the AppV 5.0 SP3 installer, you will find 2 MSI files: one for 86 bits and one for 64 bits operating systems. 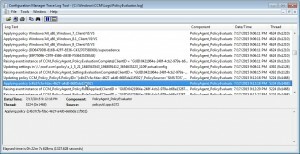 These versions will be patched with the hotfix. 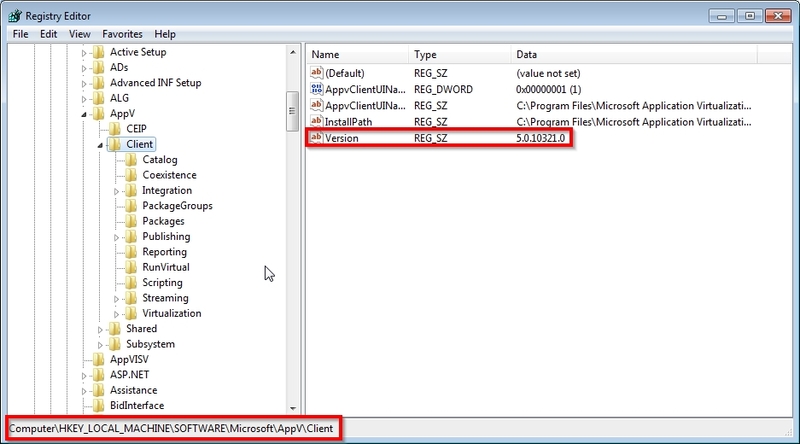 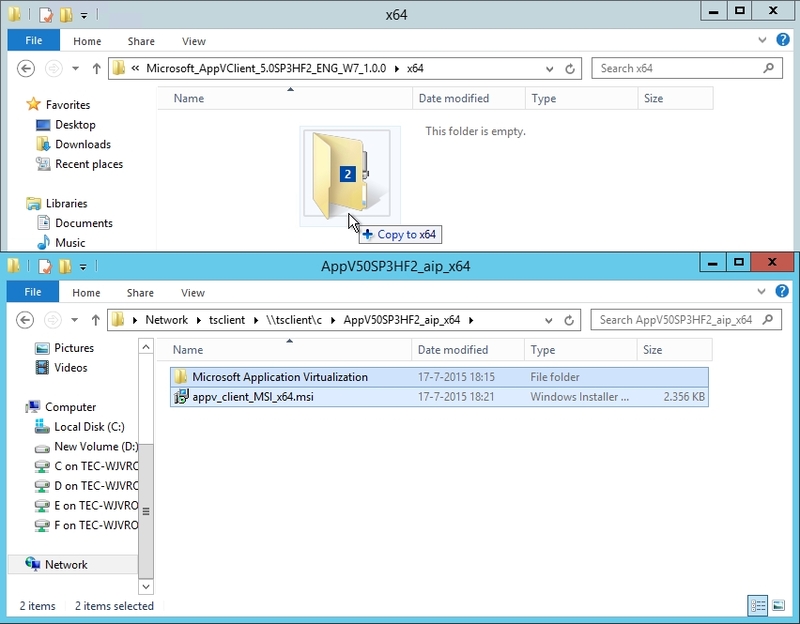 You can download MDOP 2014 R2 – which includes AppV 5.0 SP3 – from the Microsoft Volume Licensing Service Center. 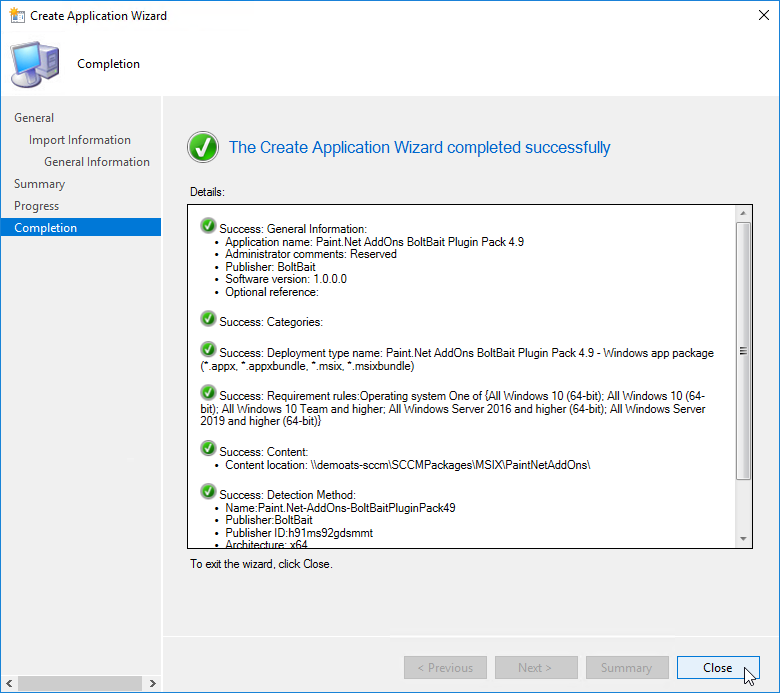 You can download Hotfix Package 2 for Microsoft Application Virtualization 5.0 Service Pack 3. 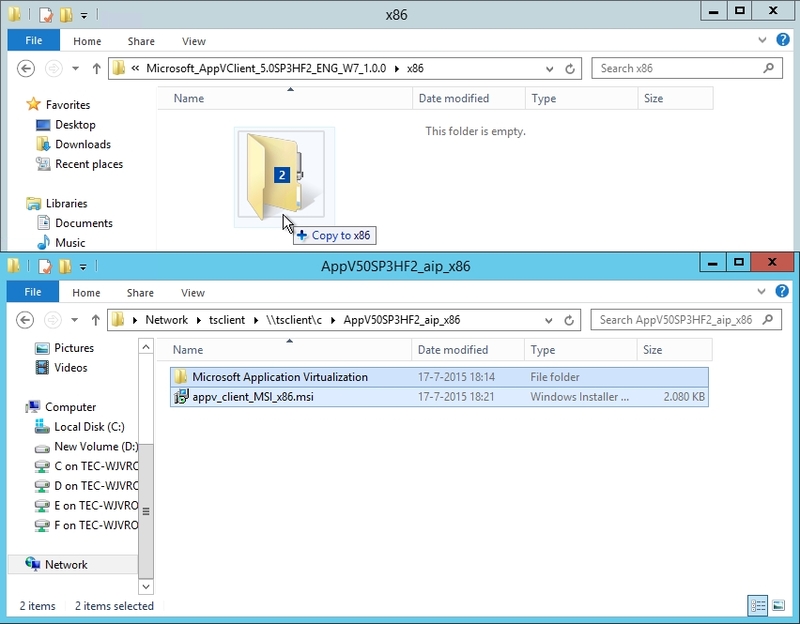 Once completed all the required steps, save the file 484280_intl_x64_zip.exe in the folder C:\AppV50SP3. 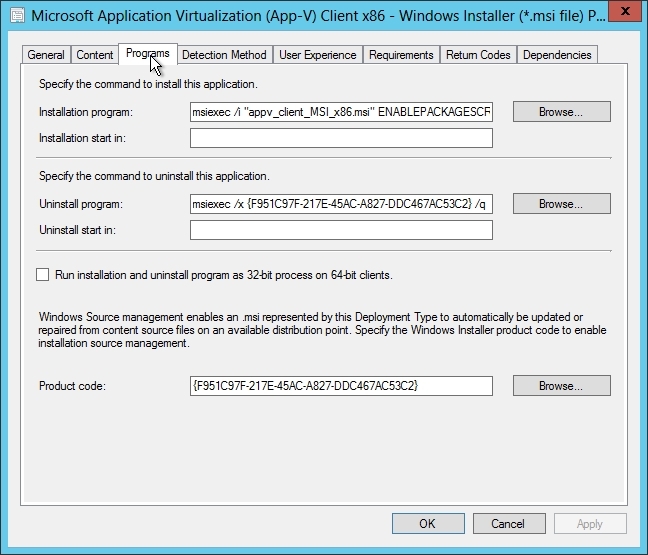 There are 2 additionals MSI files in C:\AppV50SP3: for each platform one MSI installer. 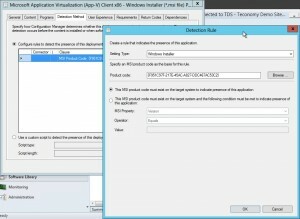 This is done via an old technique: create an administrative installation point and patch that administrative installation point with the patch. 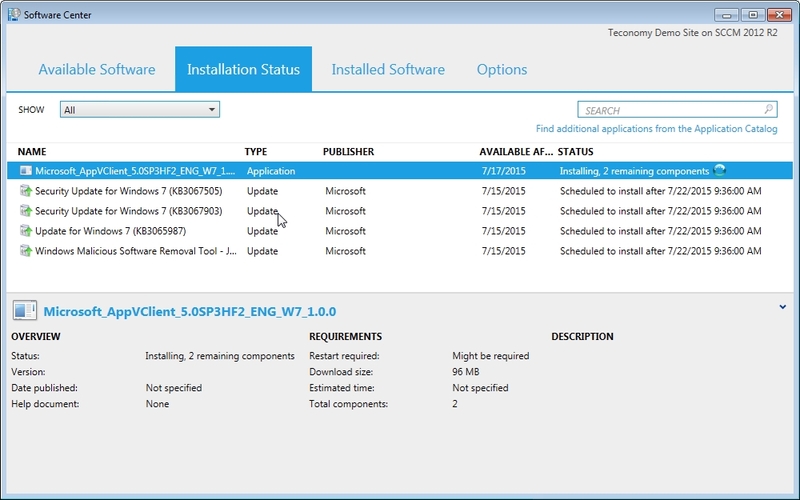 The MSI (x86) after administrative install. 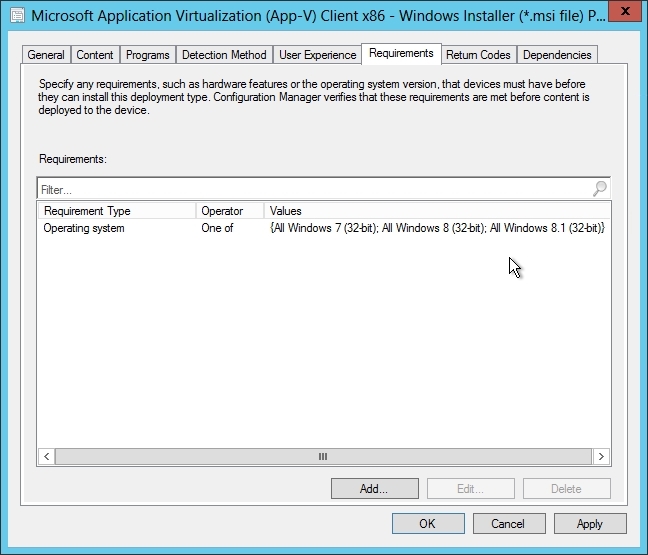 msiexec /a "C:\AppV50SP3HF2_aip_x86\appv_client_MSI_x86.msi" /p "C:\AppV50SP3\appv_client_kb3060458_x86.msp"
The MSI (x86) after patching the administrative install. 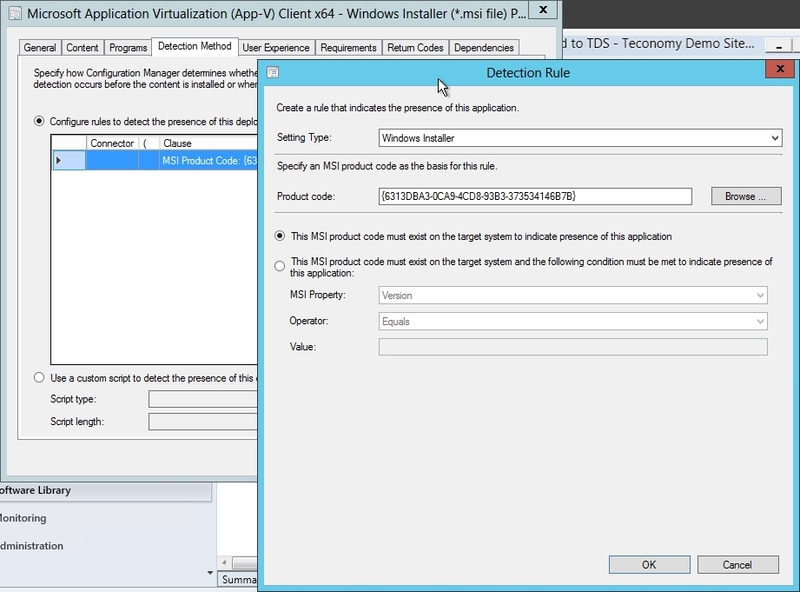 msiexec /a "C:\AppV50SP3HF2_aip_x64\appv_client_MSI_x64.msi" /p "C:\AppV50SP3\appv_client_kb3060458_x64.msp"
The MSI (x64) after patching the administrative install. 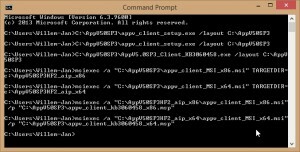 Summary of all the commands. 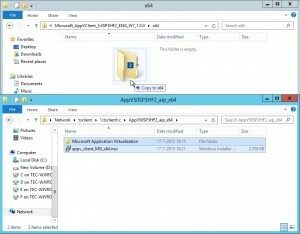 Copy the installation files (x86) to the software library. 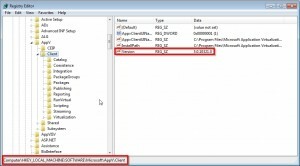 Copy the installation files (x64) to the software library. 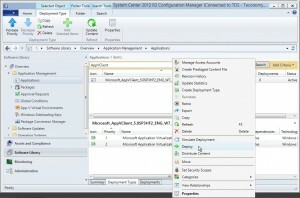 Create the SCCM 2012 applications as per screen prints below. 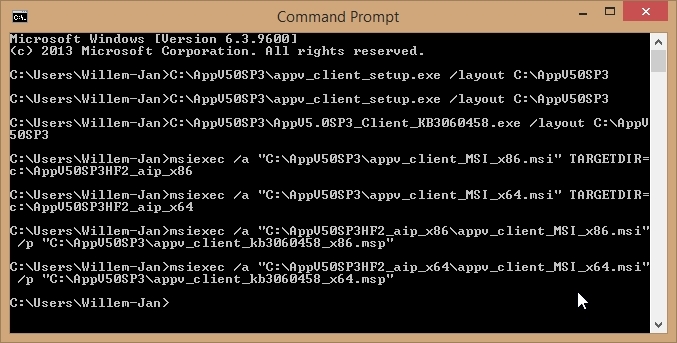 The installation command line should at least contain ACCEPTEULA=1. 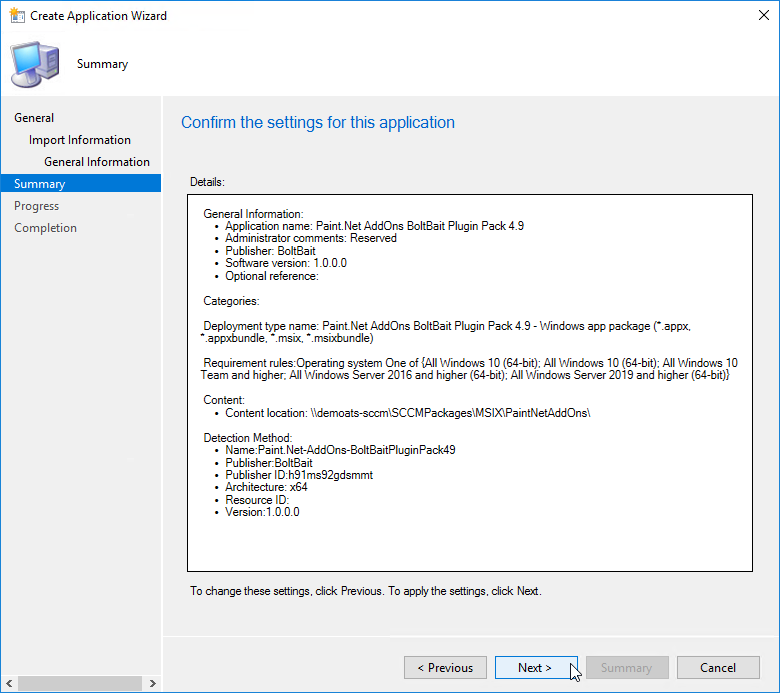 I always add ENABLEPACKAGESCRIPTS=1 so you can add virtualized Click 2 Run packages later.Then there is no need to set this via GPO later. 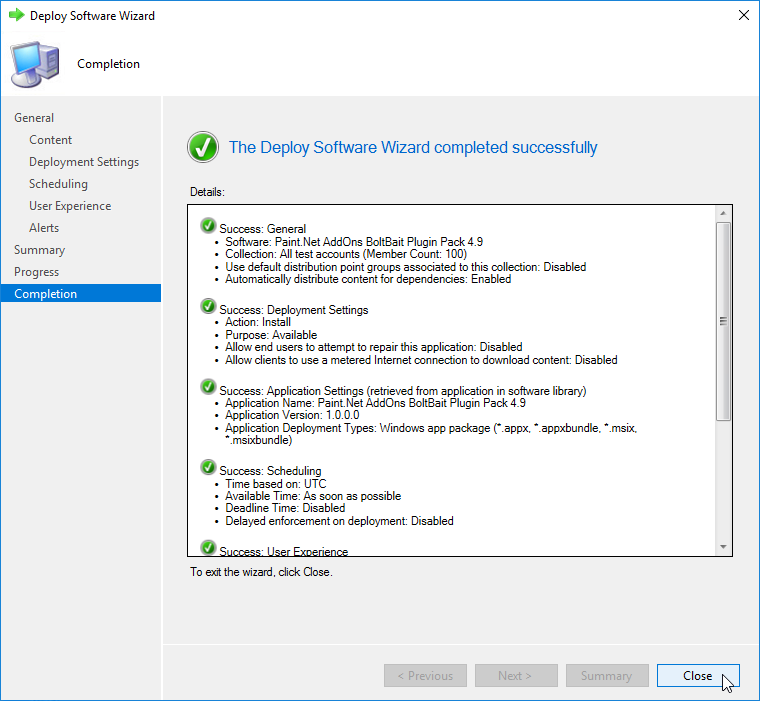 Upg After creating the application and deployment types. 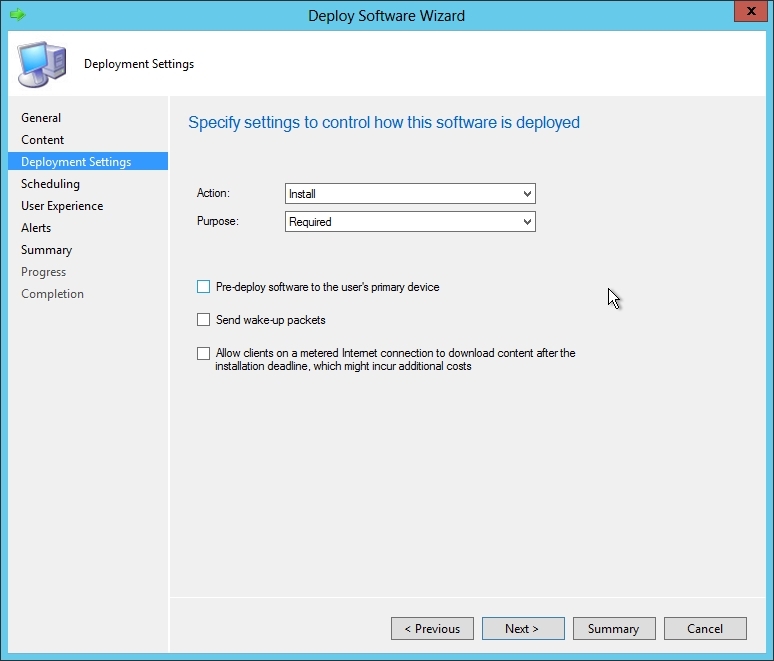 The deployment is set as required. 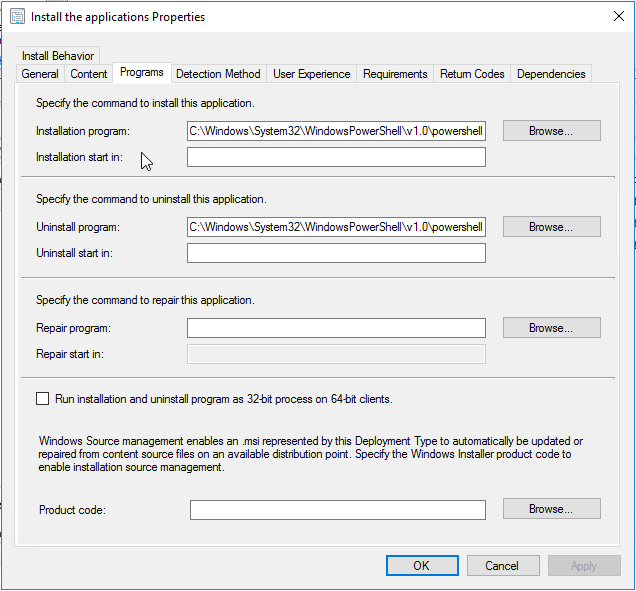 Ignore the maintenance window for installations. 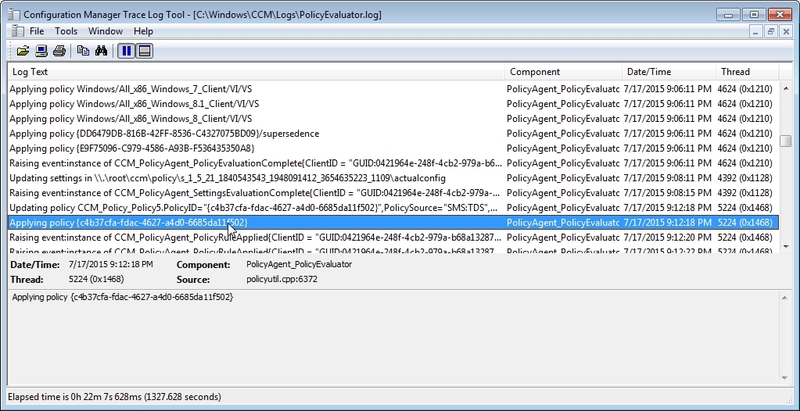 The policy is applied on the client. And the new AppV client is installed. 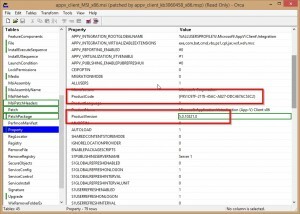 For whatever reason, Microsoft has decided not to change the ProductCode property. 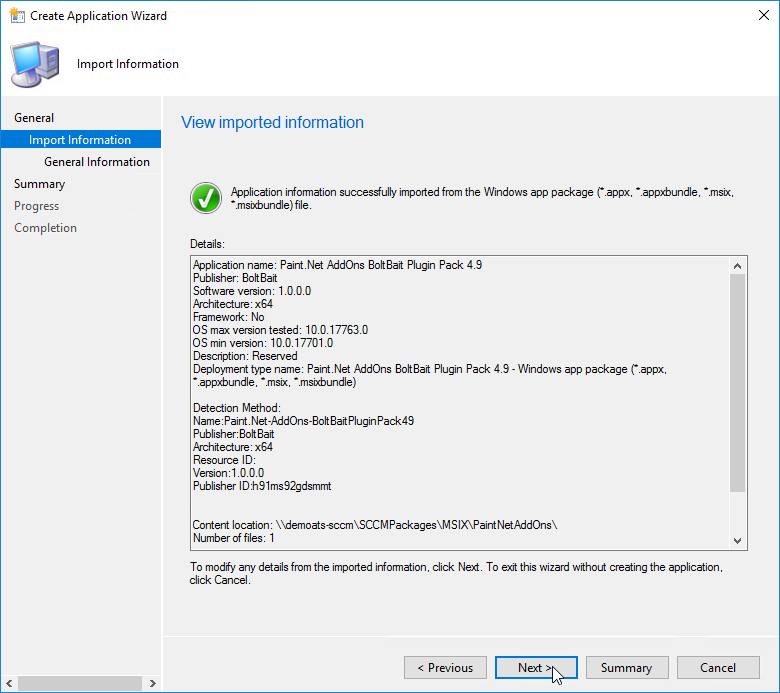 Thus all the AppV 5.0 SP3 packages share the same ProductCode. 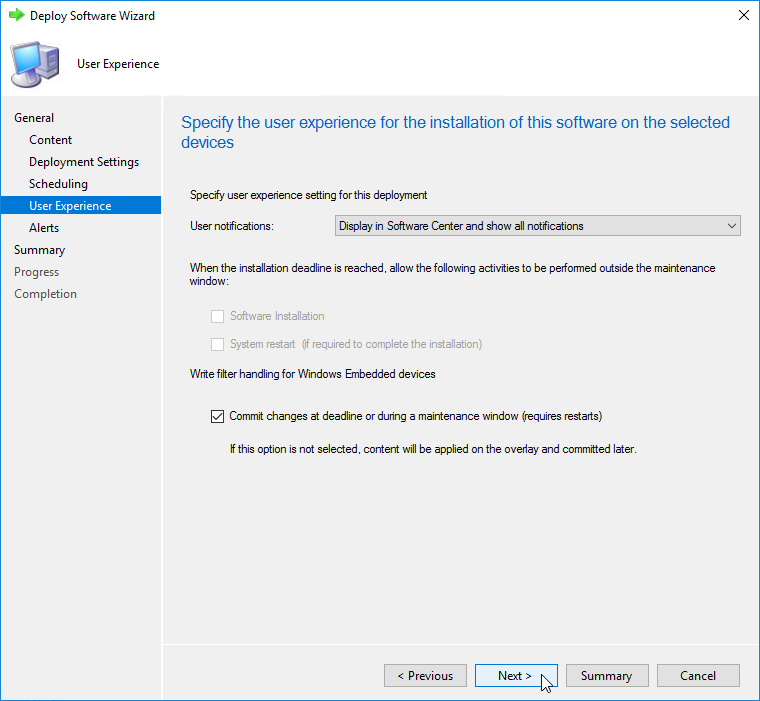 The patch does only update the ProductVersion (x86). 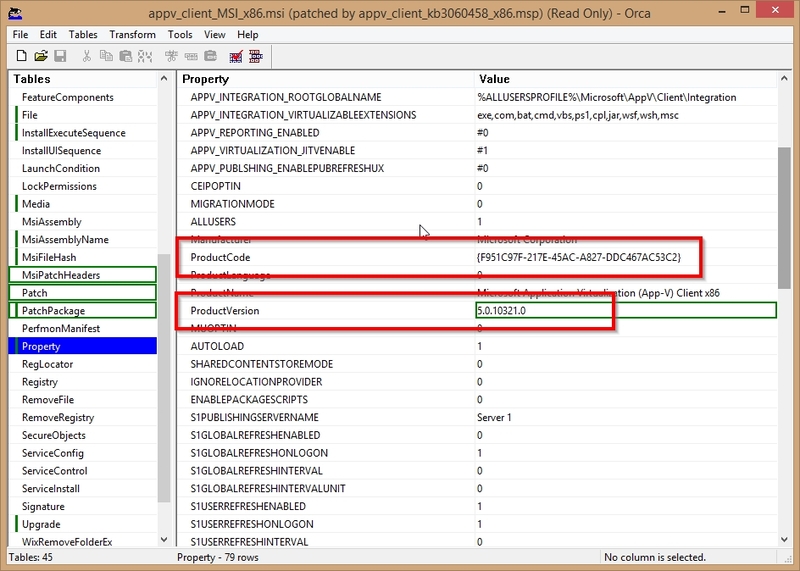 The PATCHNEWPACKAGECODE property is ignored (x86). 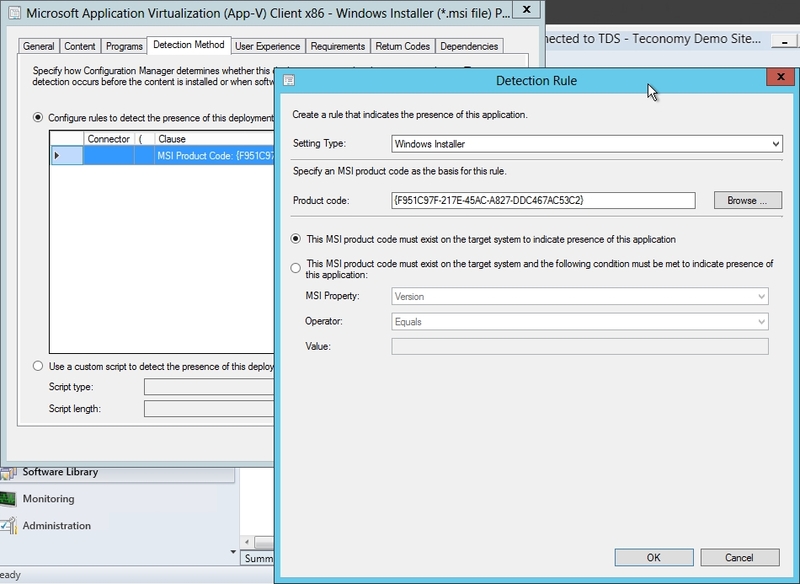 Uninstall the old AppV50SP3 client and install the new AppV50SP3HF2 client. Apply only the patch. 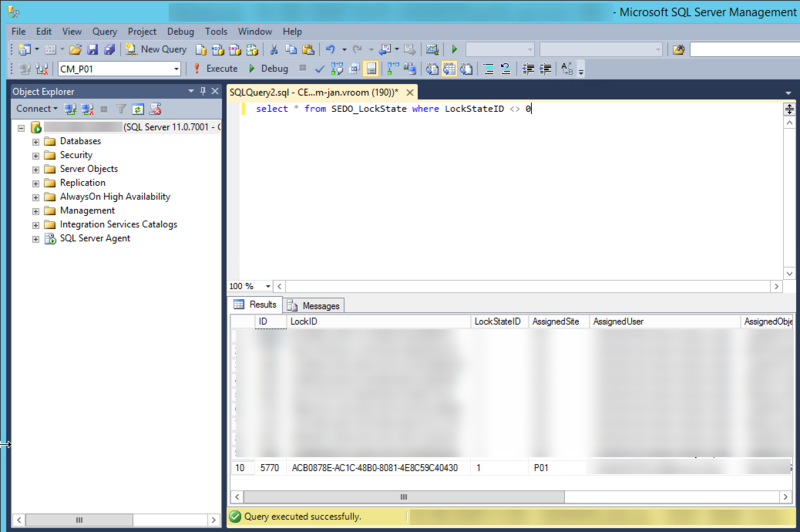 I have not tested this scenario. 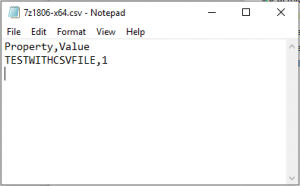 Error message that AppV 46 cannot be found in ccmcache. 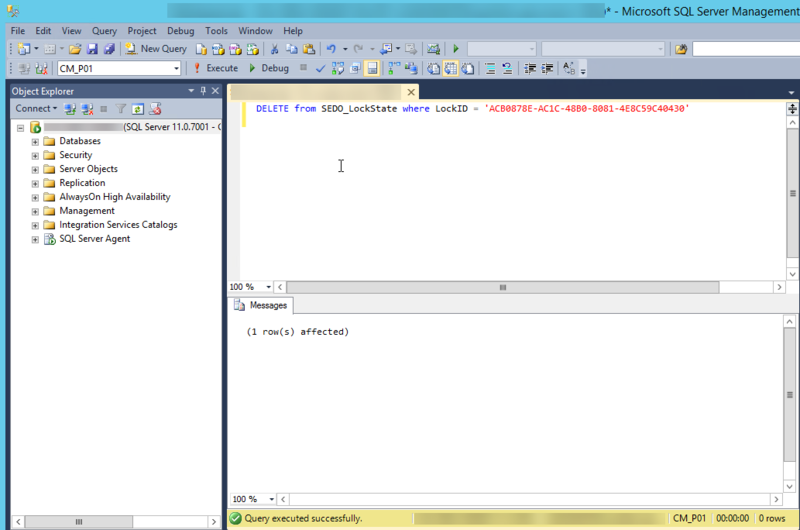 What happens. 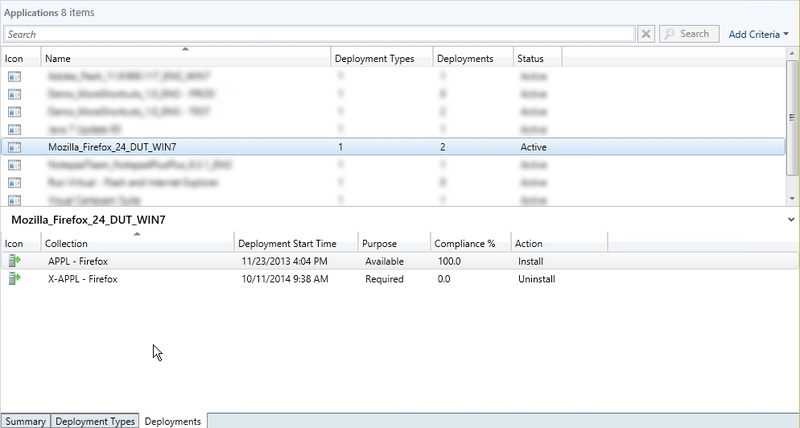 During the client migration the ccmcache is cleared. 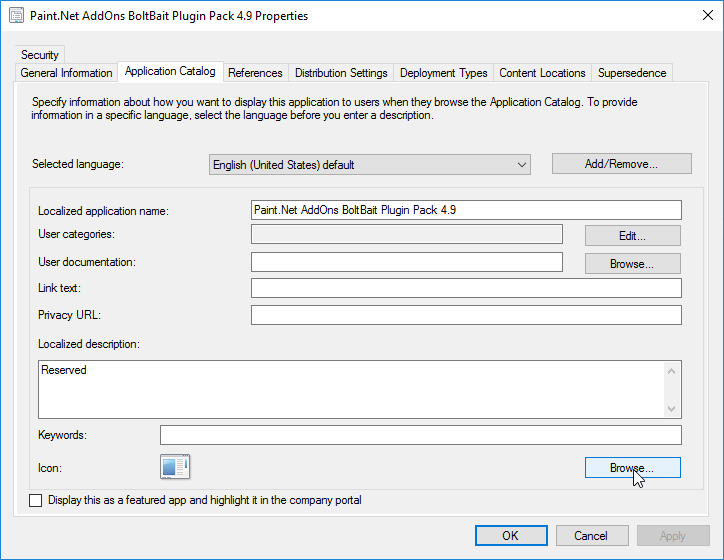 So if an AppV 4.6 package has not been started before the migration, the content could not be found after starting the package after the migration. 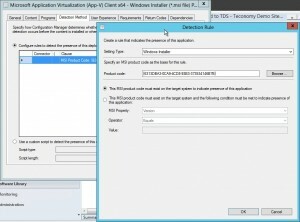 That has been solved by creating a vbscript that is run before the SCCM 2007 client is migrated to SCCM 2012. In short: for each AppV 4.6 application the virtual package is loaded into the AppV Cache.
' 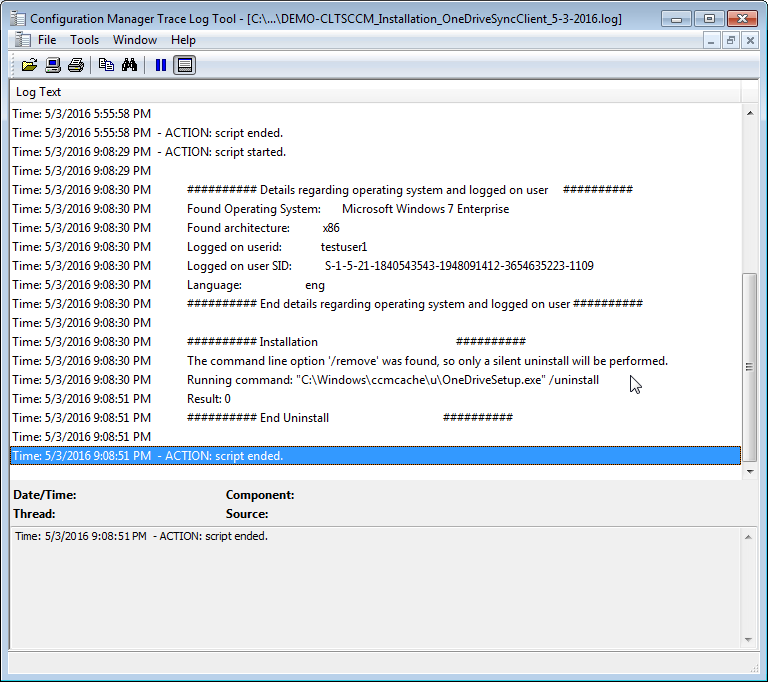 (c) Canon Europe B.V.
'     - For each entry a log file is created. 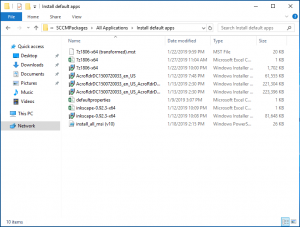 Dim strCommand             : strCommand           = ""
Dim strLogLocation         : strLogLocation       = "C:\WINDOWS\system32\Logfiles"
Dim strOutputFile          : strOutputFile        = strLogLocation & "\" & strcomputerName & "_ReinstallAllAppV46Packages_" & Replace(FormatDateTime(Now(), 2),"/","-") & ".log"
Dim strOS                  : strOS                = ""
Dim strKeyPath             : strKeyPath           = ""
Dim strArchitecture        : strArchitecture      = "x86"
' Detect the current OS architecture.
' 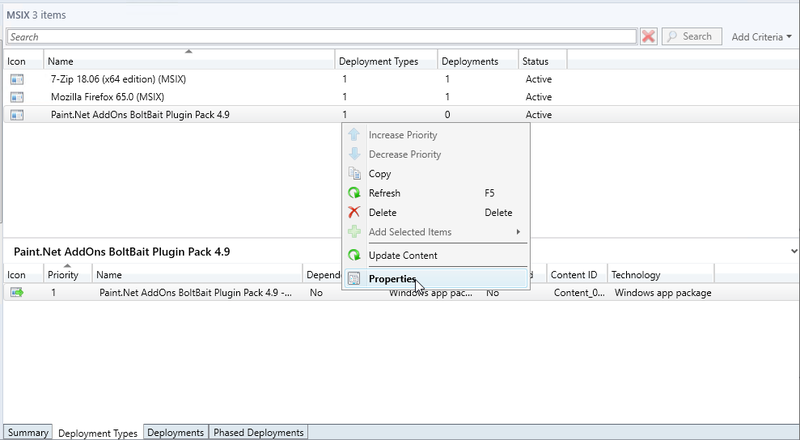 Load the App-V 4.6 packages. 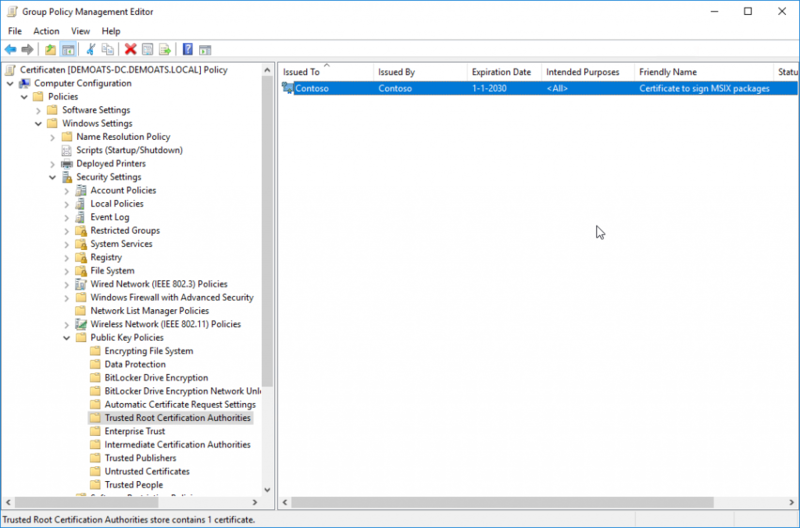 Dim strFolder     : strFolder     = ""
strCommand = "sftmime unlock package:" & strSoftGridPackageName & " /LOG c:\windows\system32\logfiles\Unlock_AppV46Package_" & strSoftGridPackageName & ".log"
strCommand = "sftmime unload package:" & strSoftGridPackageName & " /LOG c:\windows\system32\logfiles\Unload_AppV46Package_" & strSoftGridPackageName & ".log"
strCommand = "sftmime load package:" & strSoftGridPackageName & " /sftpath "
strCommand = strCommand & chr(34) & strSoftGridSFTName & chr(34) & " /LOG c:\windows\system32\logfiles\Load_AppV46Package_" & strSoftGridPackageName & ".log"
In my article Uninstall AppV 5.0 package automatically if an user is removed from a user based collection in SCCM 2012 I described how an application is removed if an user is removed from an user based collection. 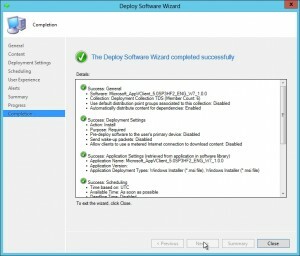 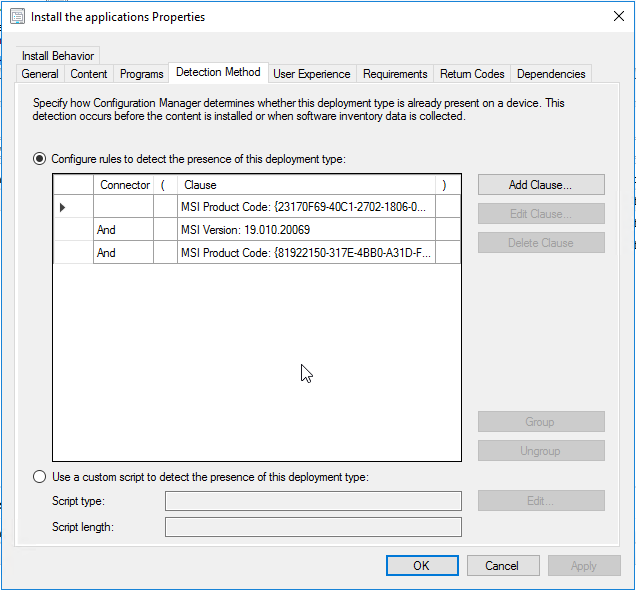 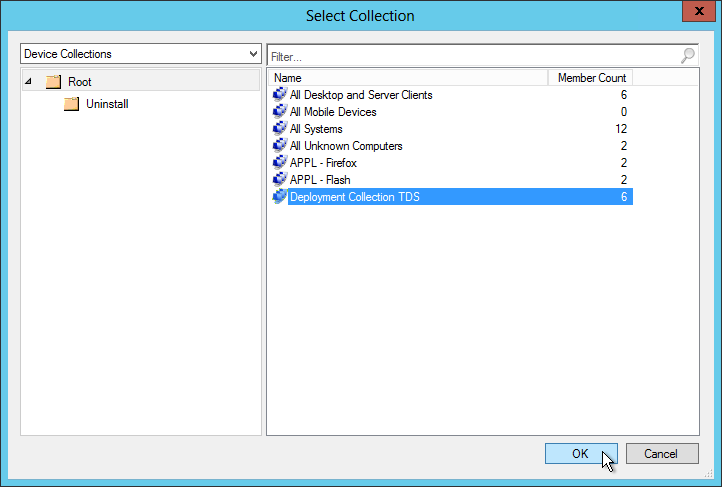 In this article I will describe how an application is uninstalled if a computer is removed from a device based collection. 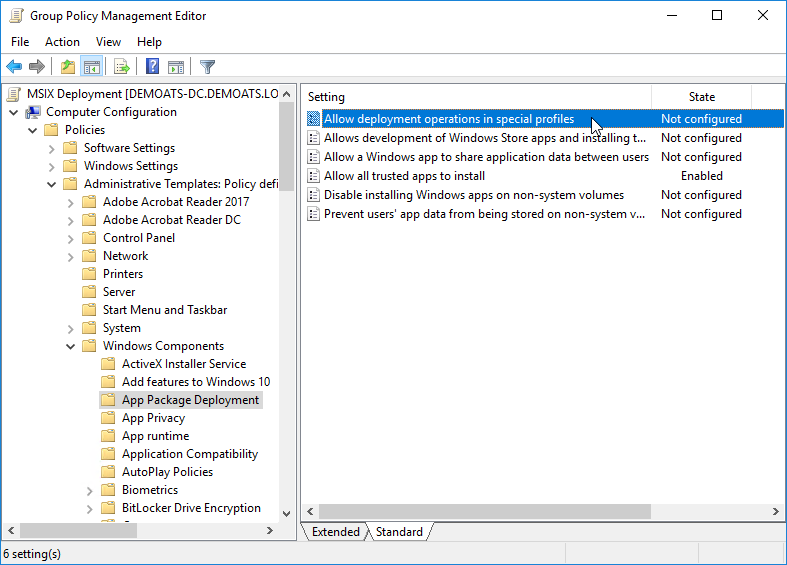 On page 30 in the document Managing AppV5 with Configuration Manager 2012SP1 it is described how a computer based uninstall collection is made. 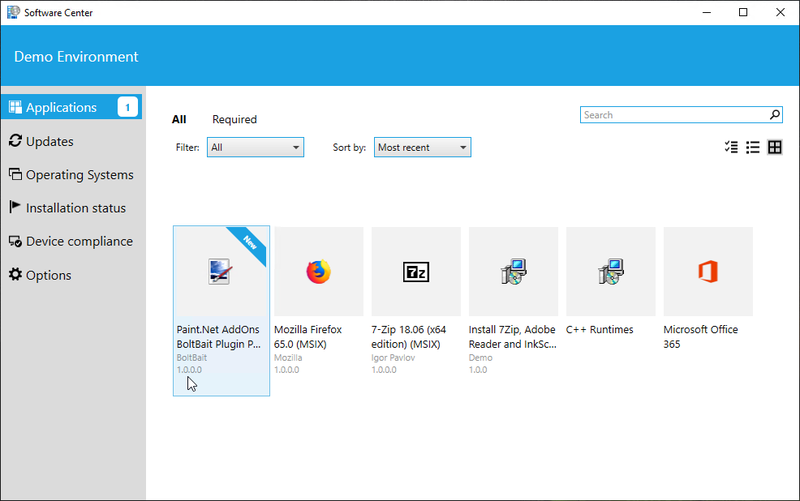 The application ‘Mozilla_Firefox_24_DUT_WIN7’ has both an install and uninstall deployment.